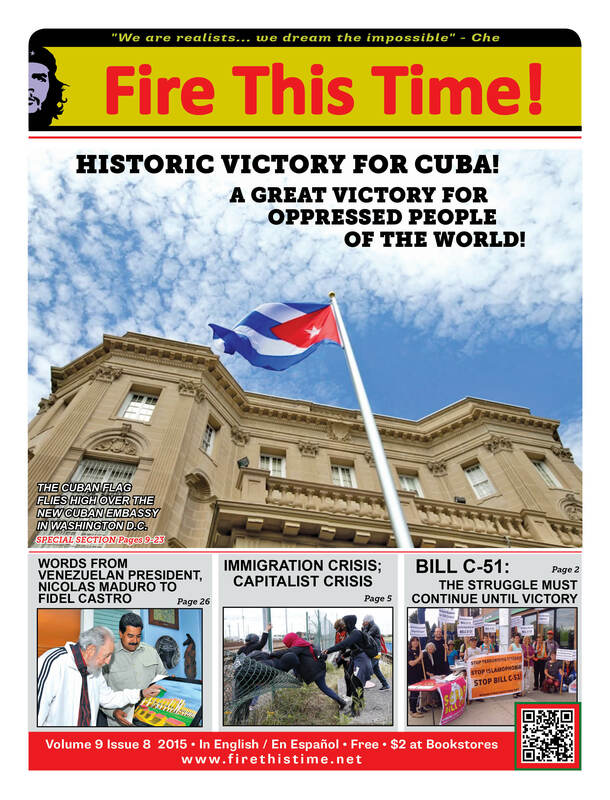 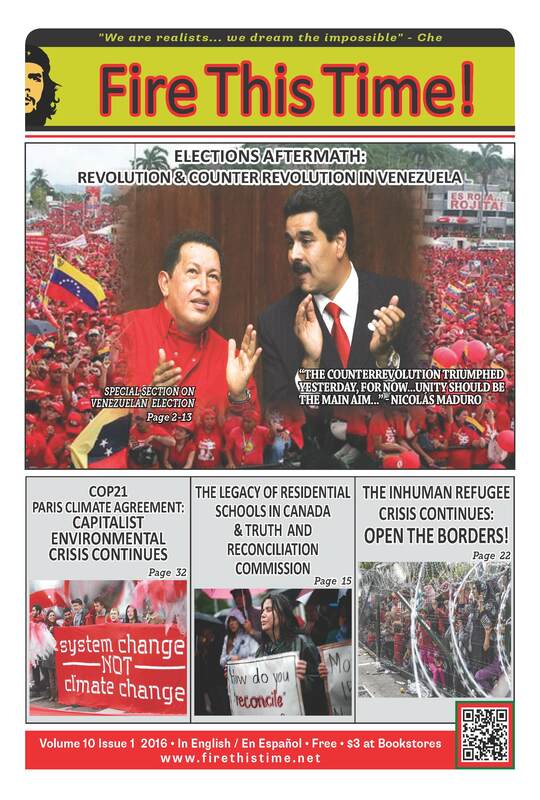 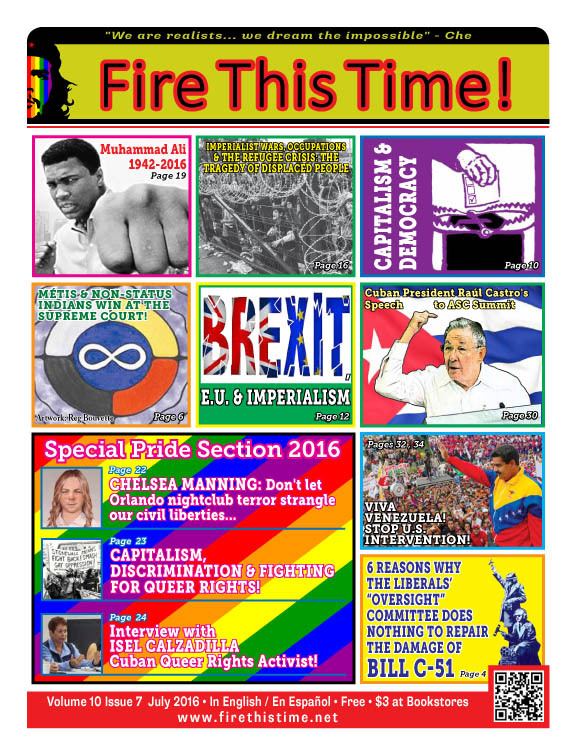 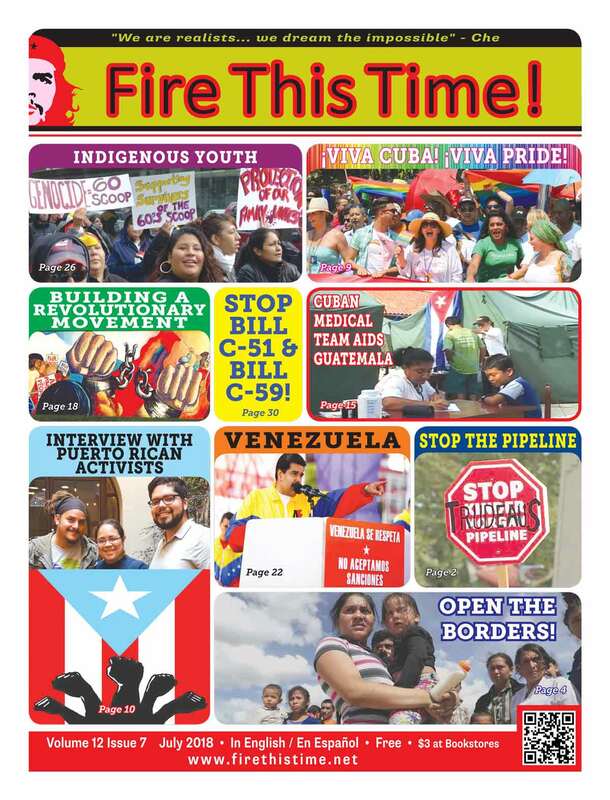 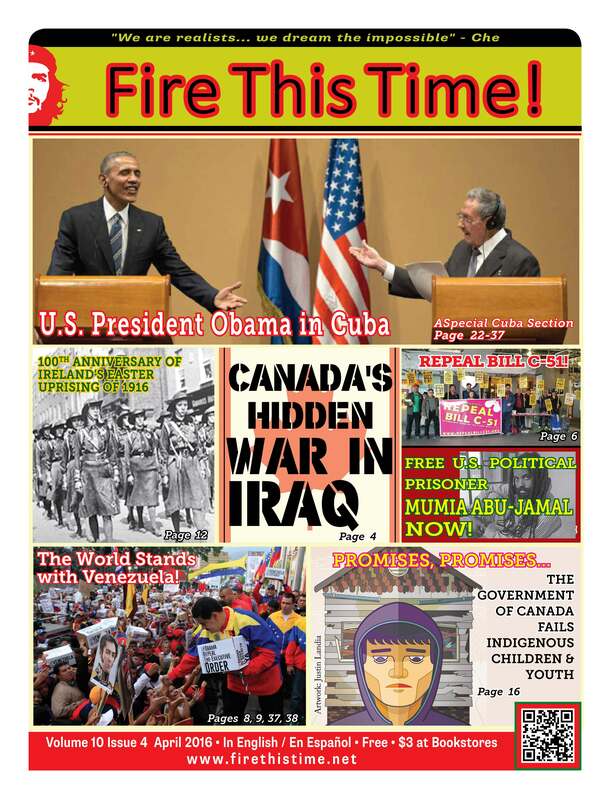 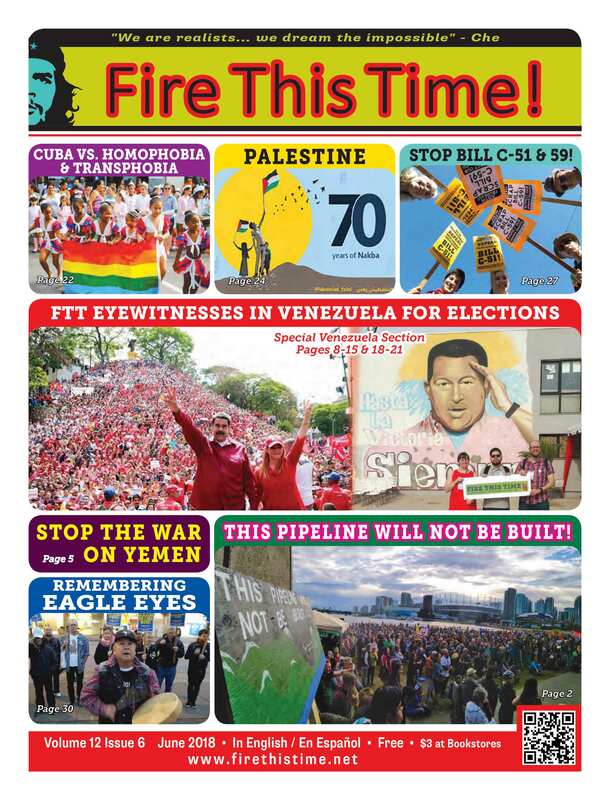 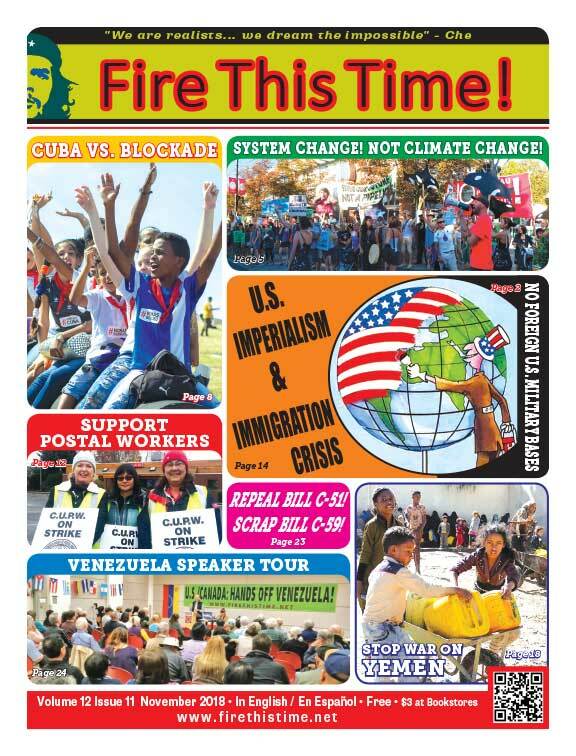 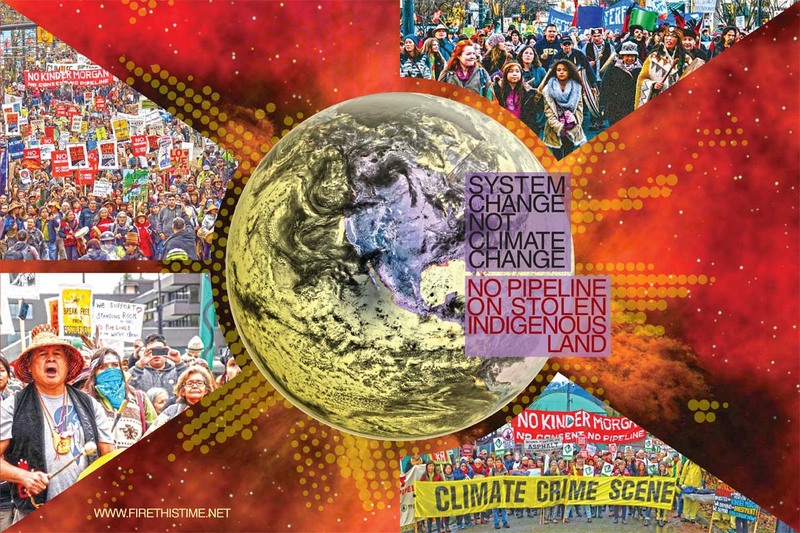 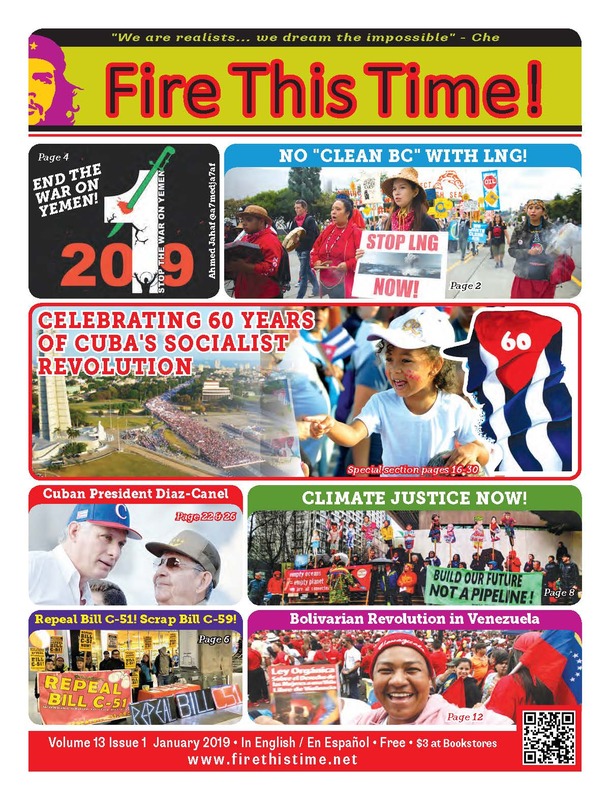 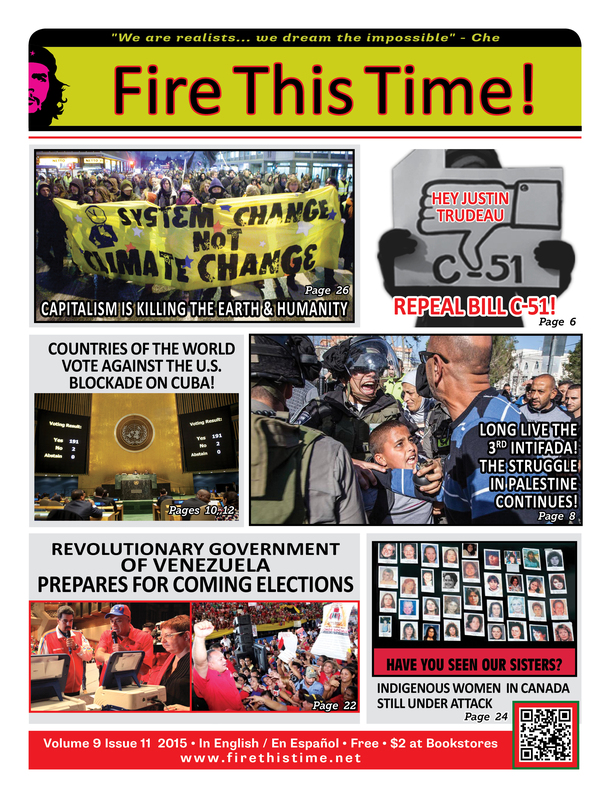 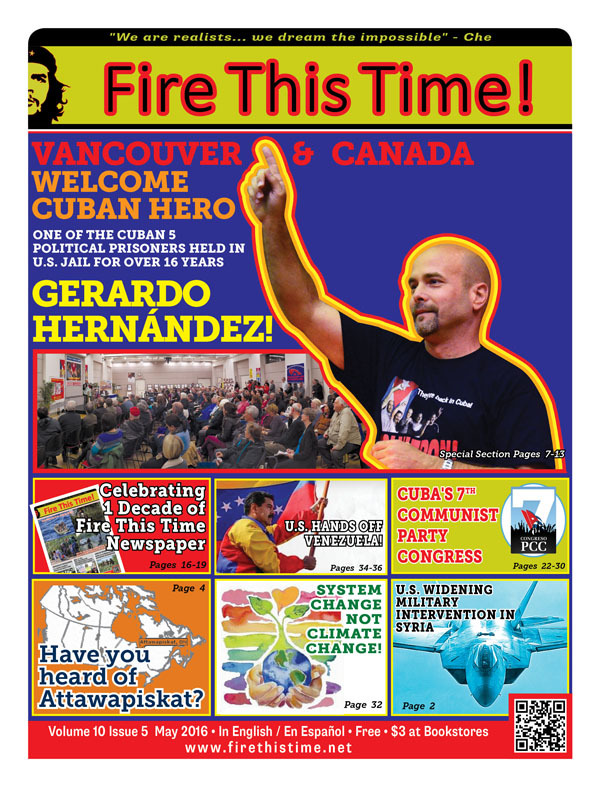 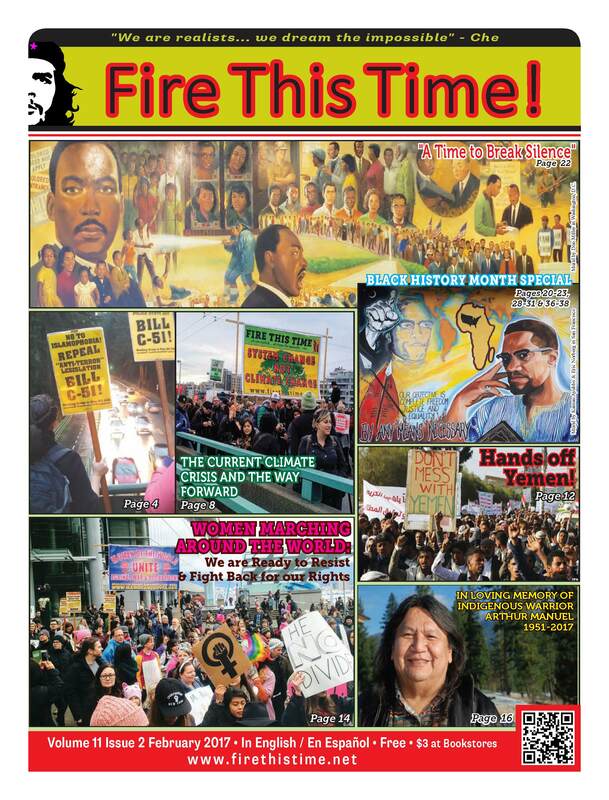 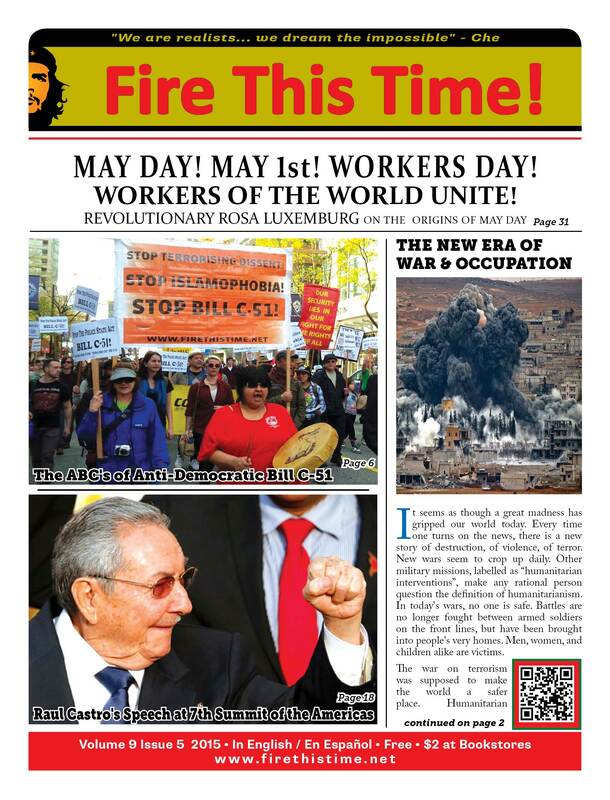 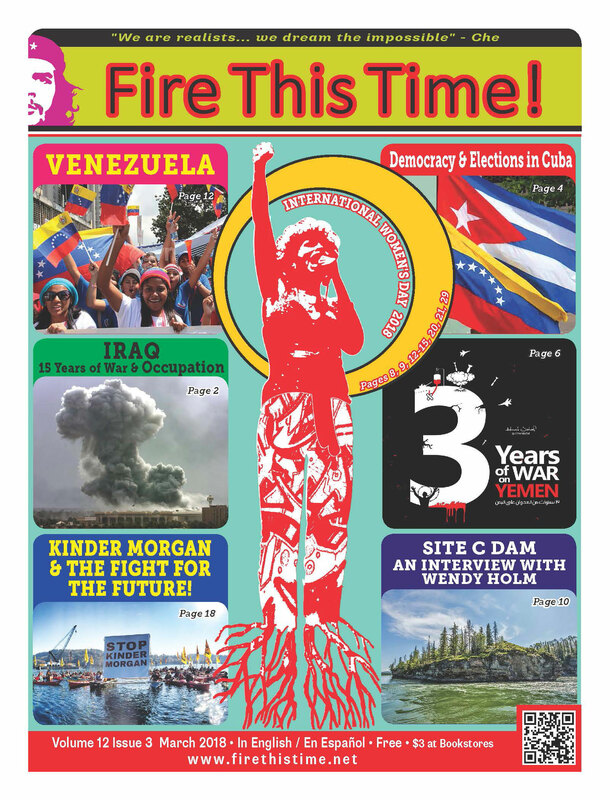 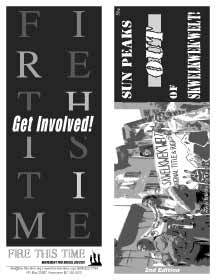 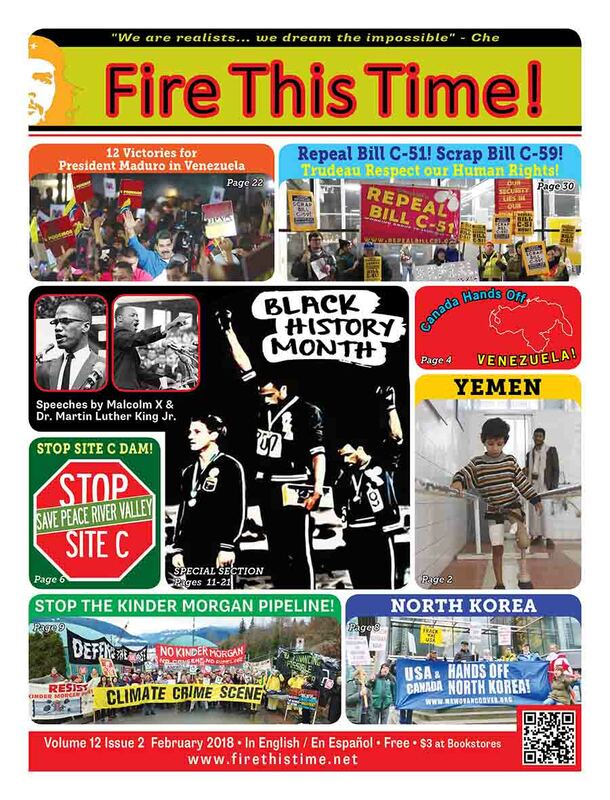 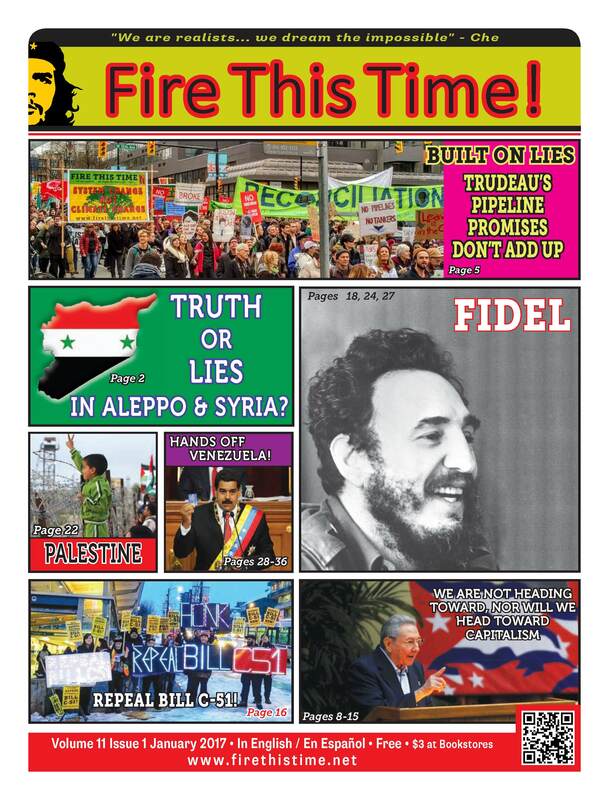 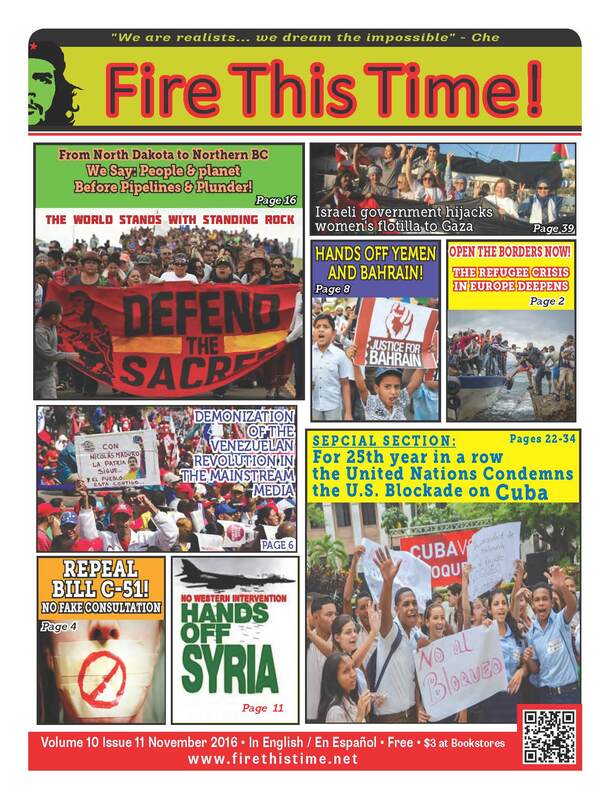 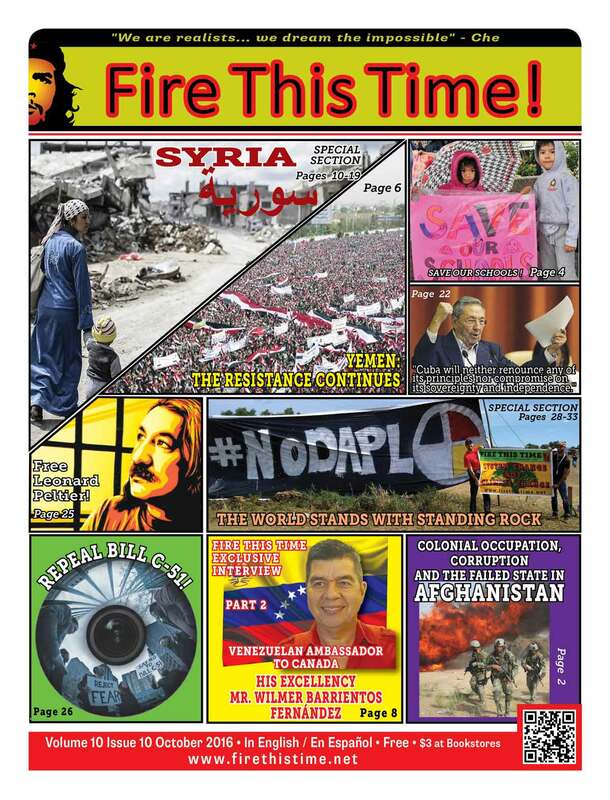 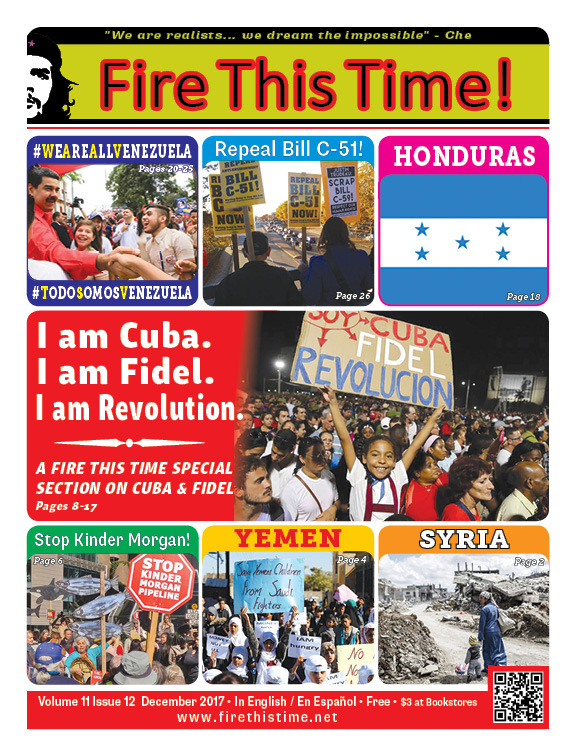 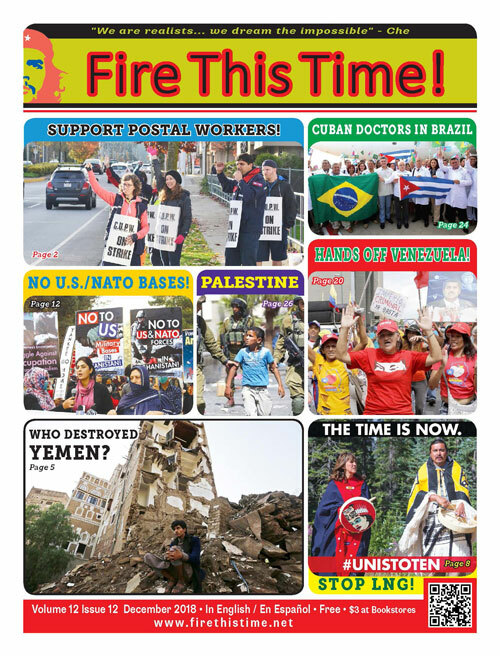 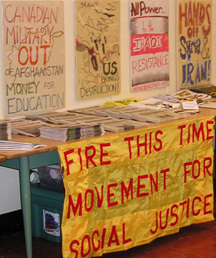 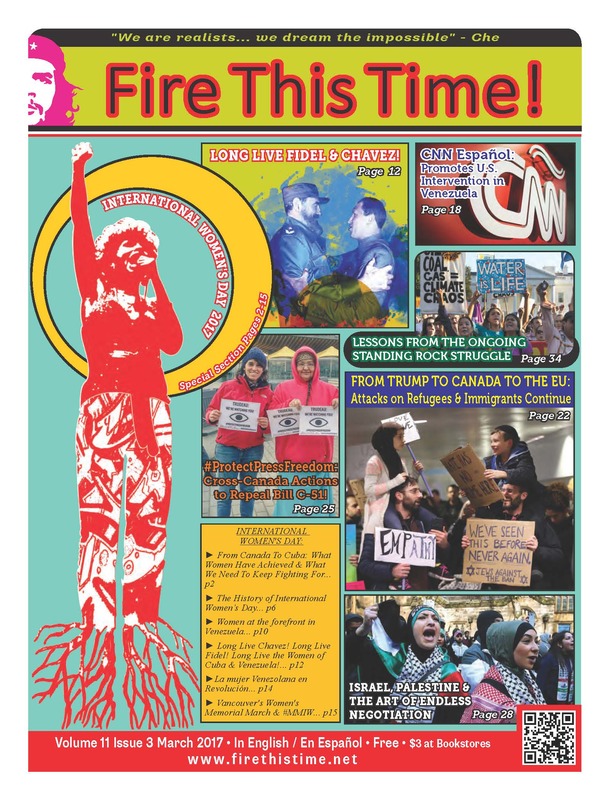 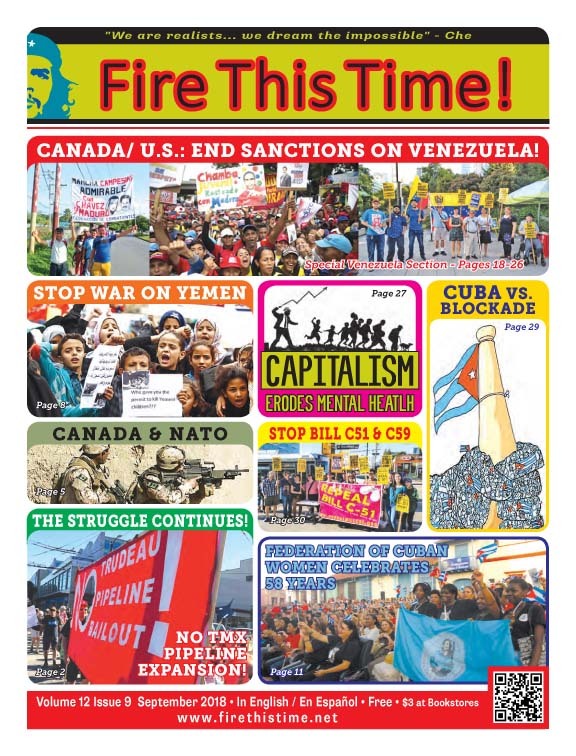 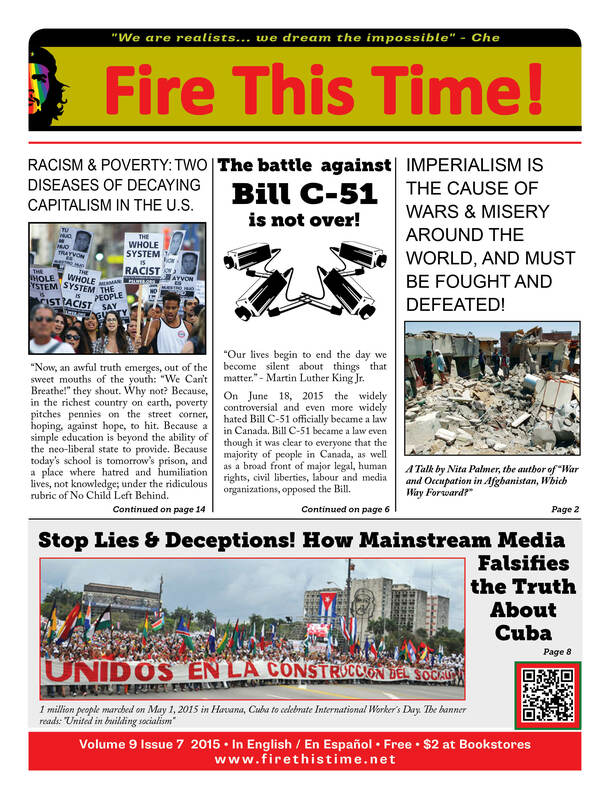 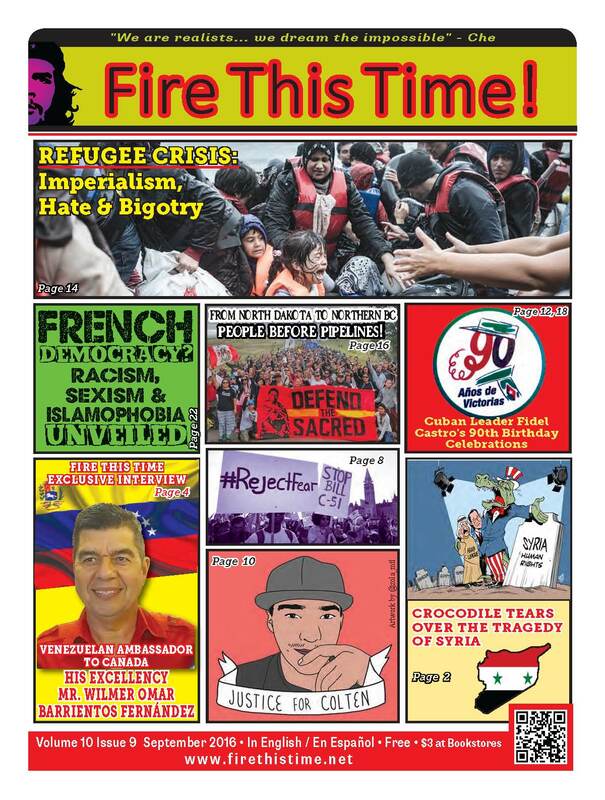 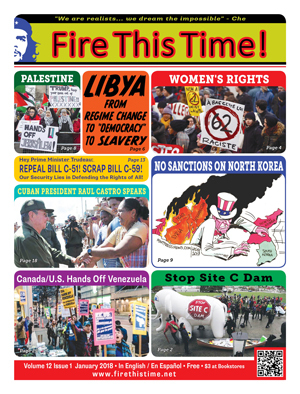 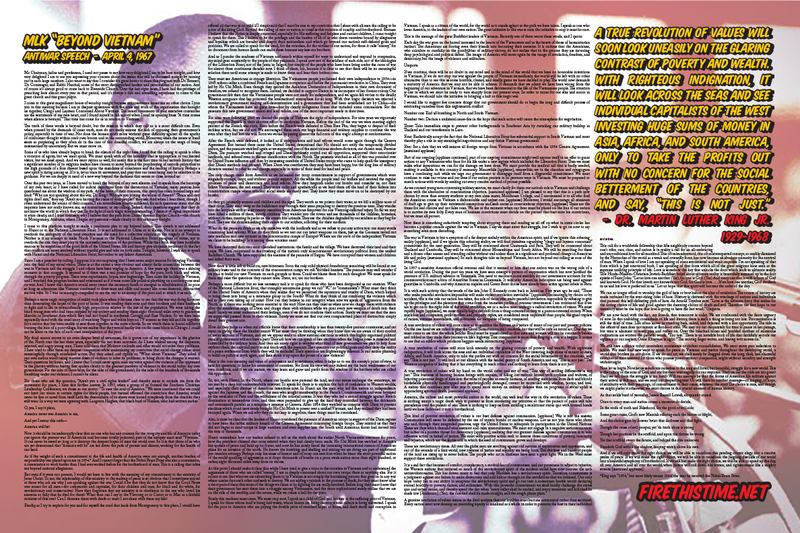 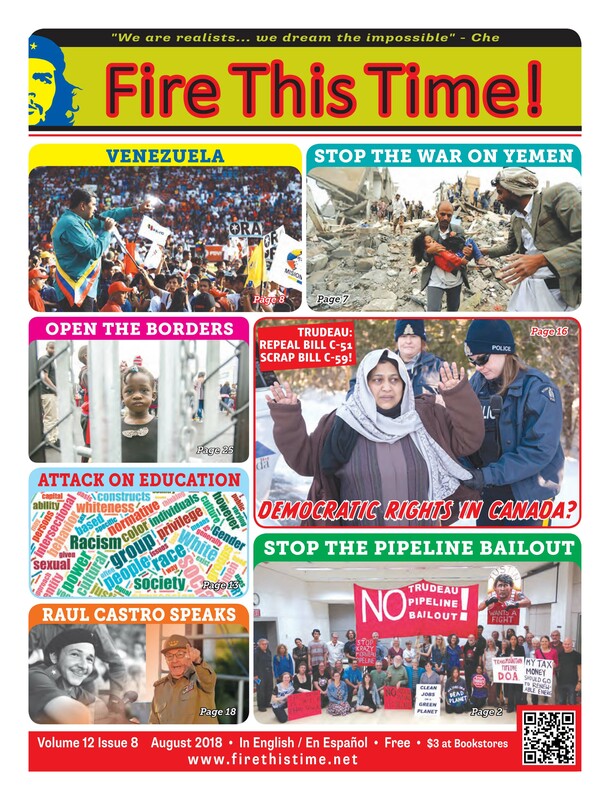 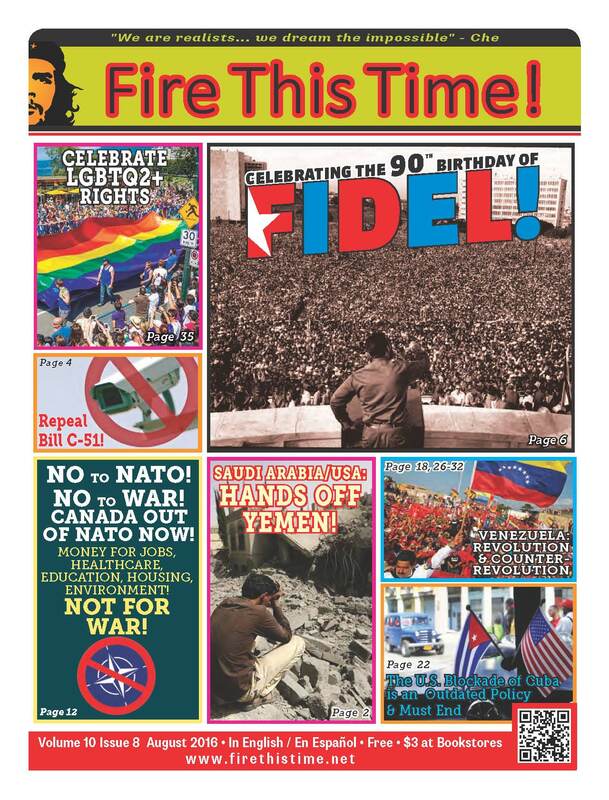 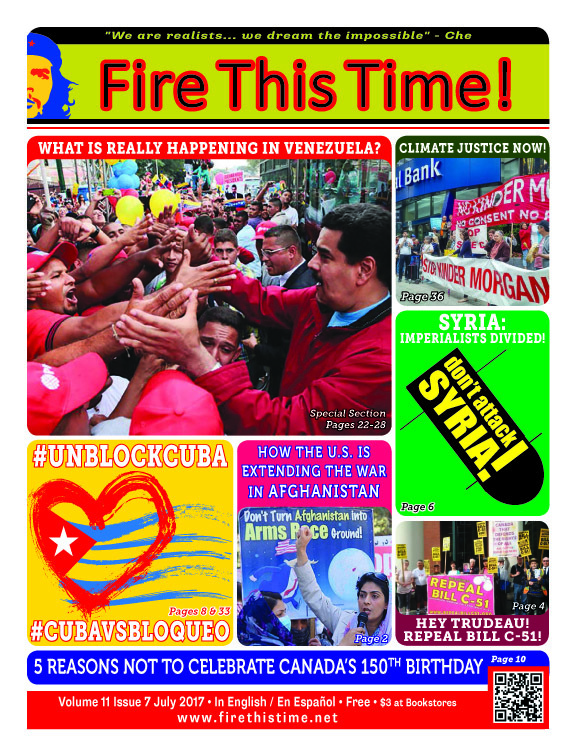 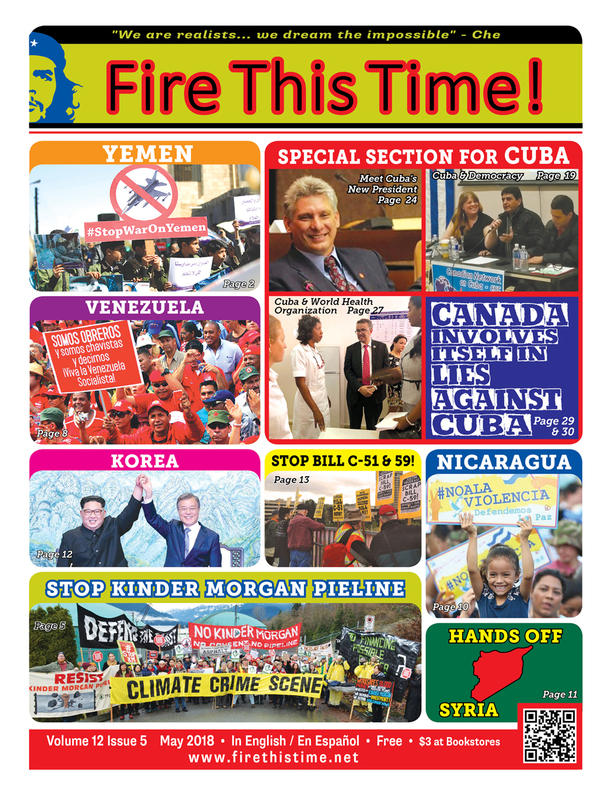 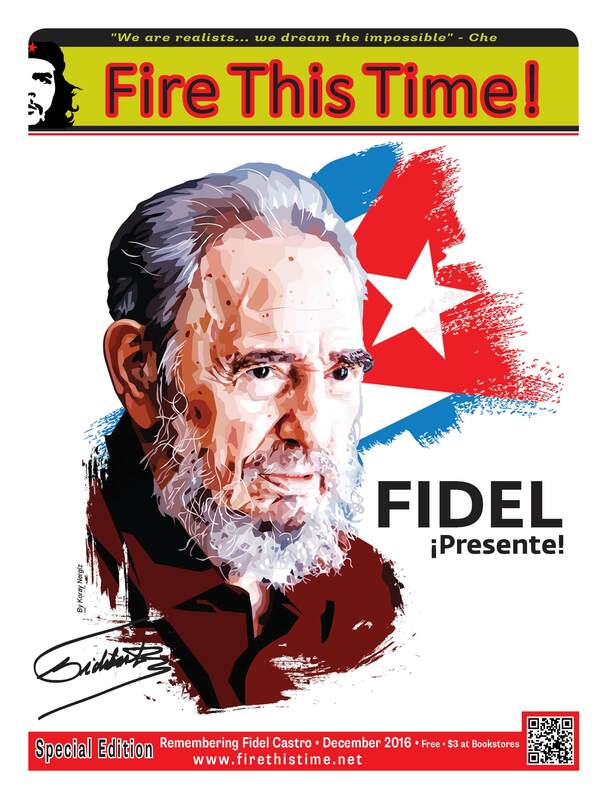 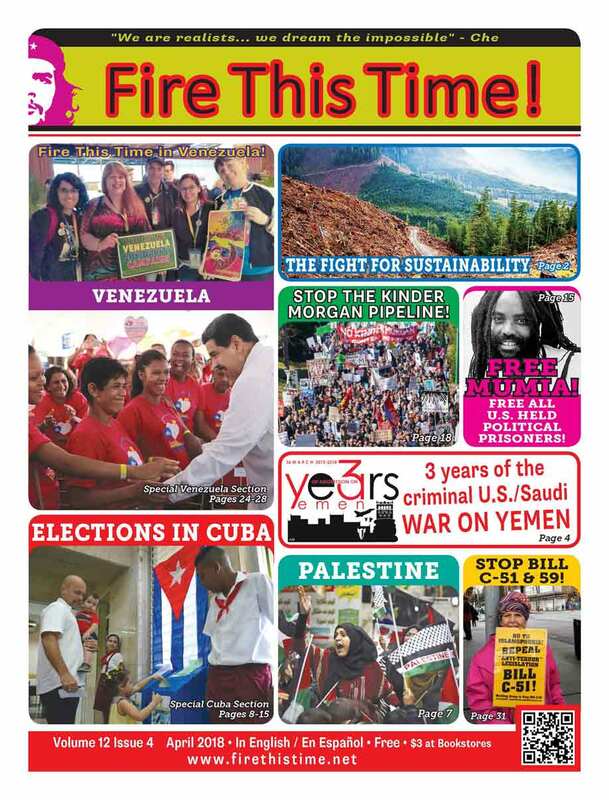 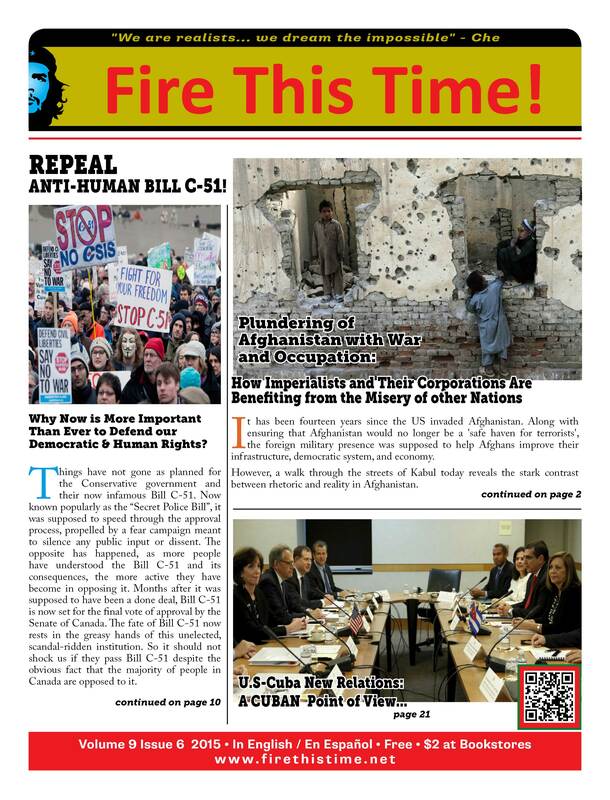 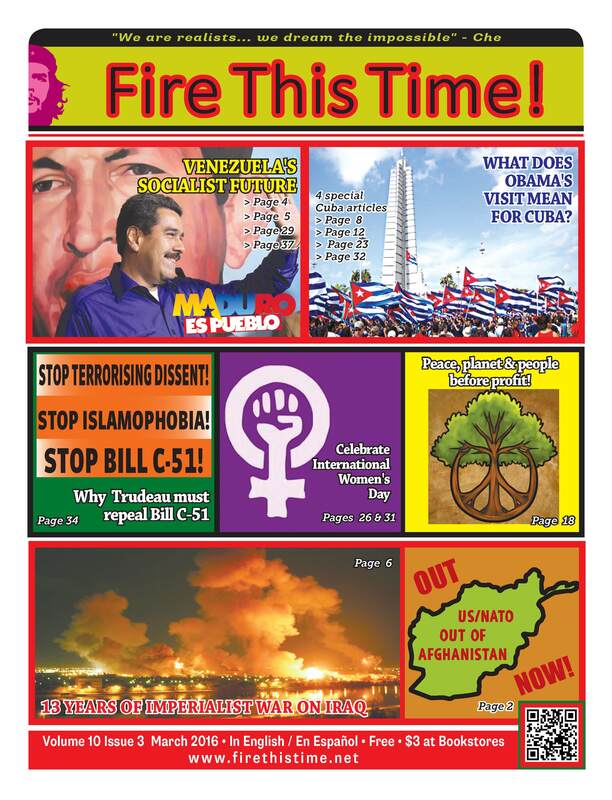 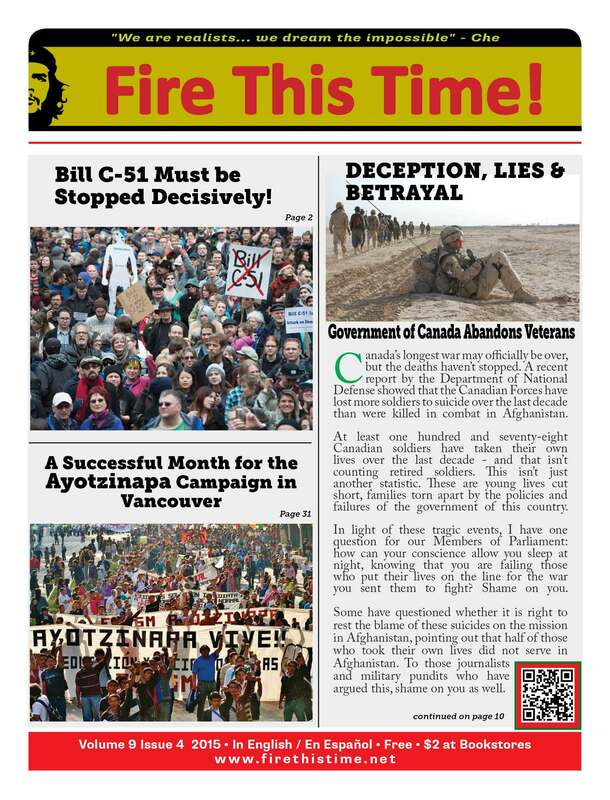 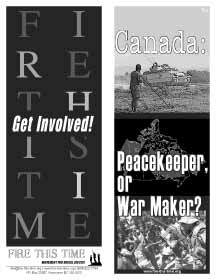 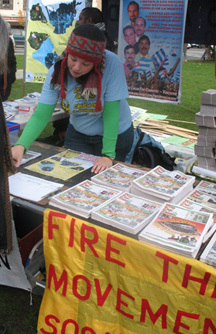 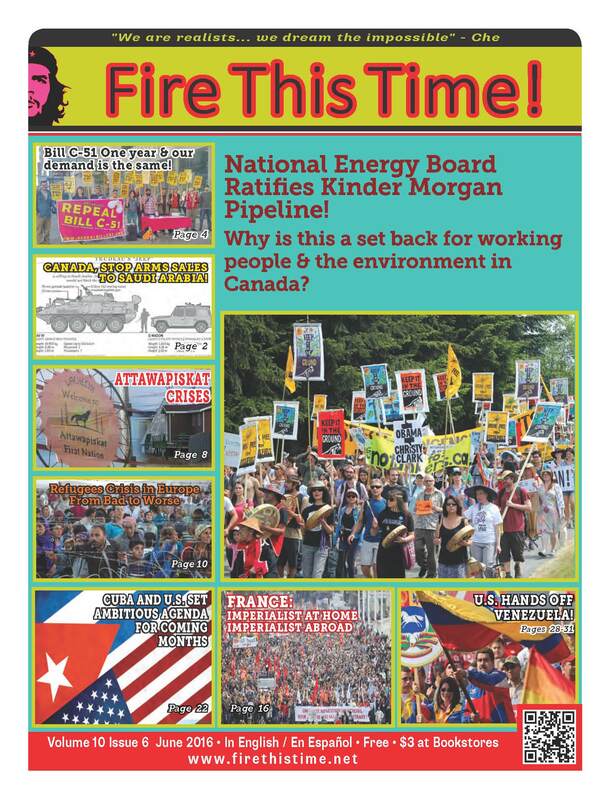 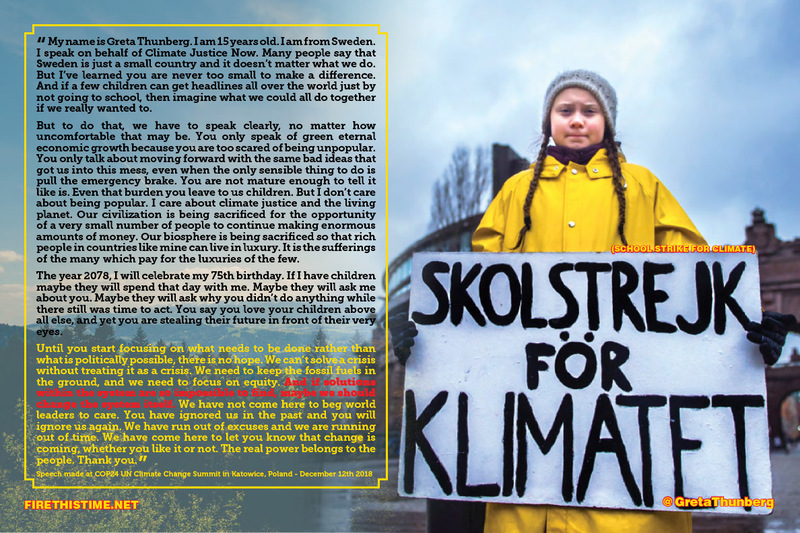 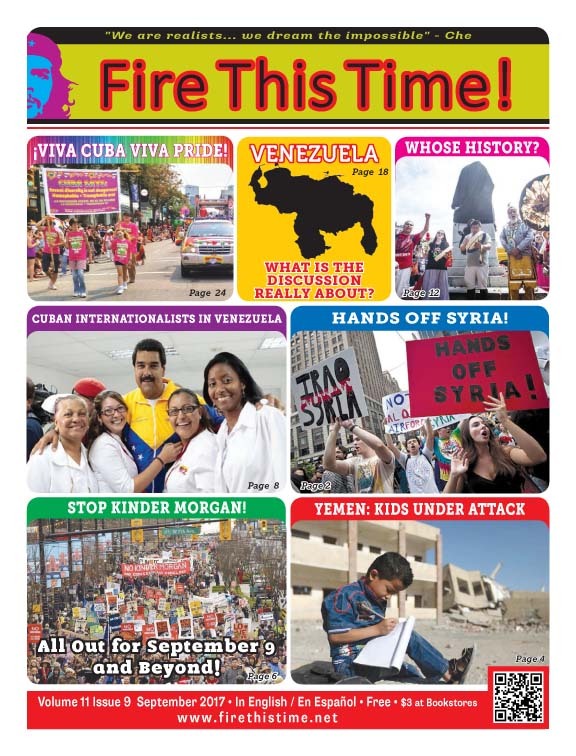 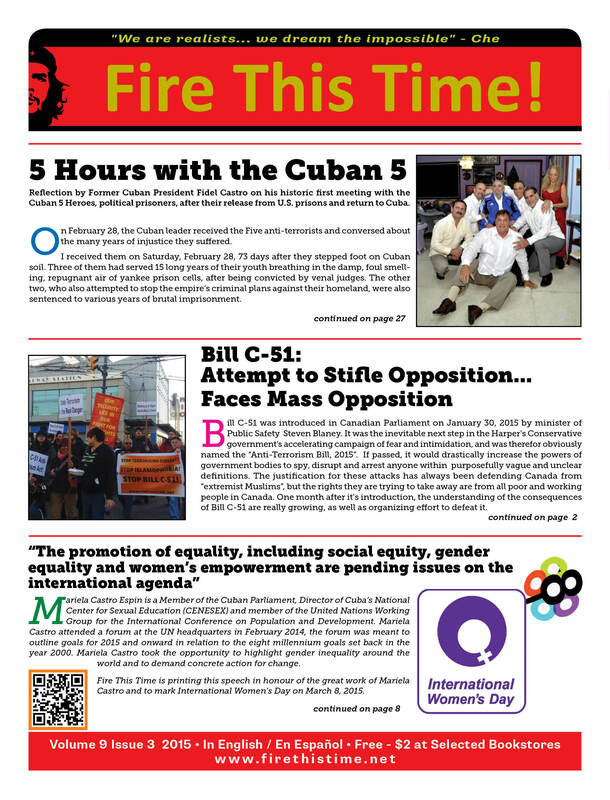 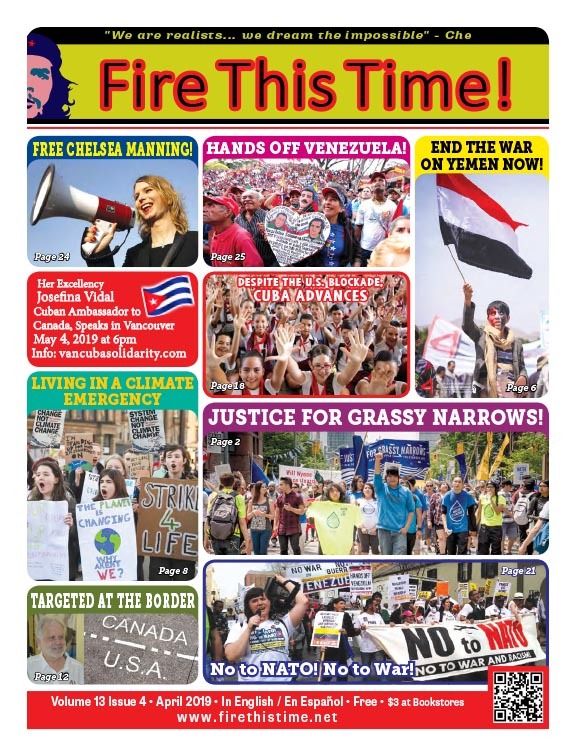 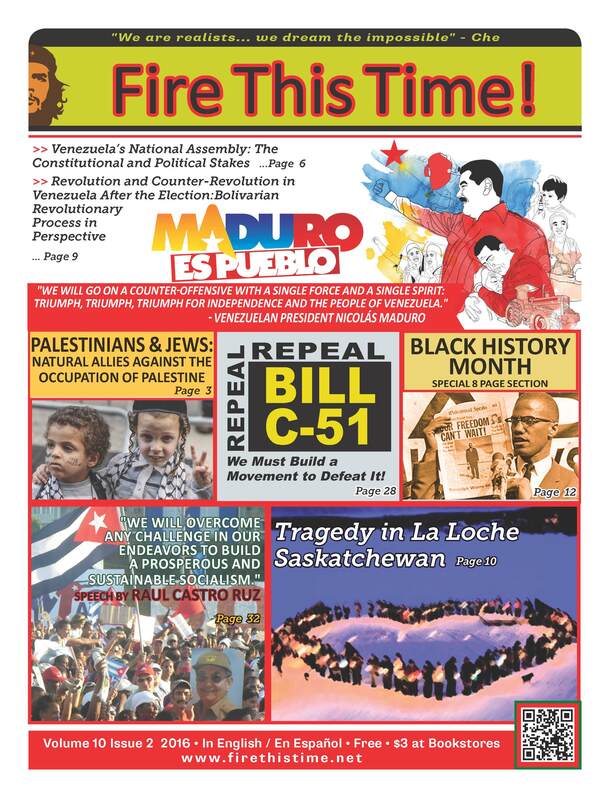 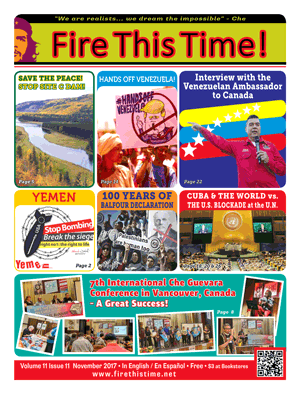 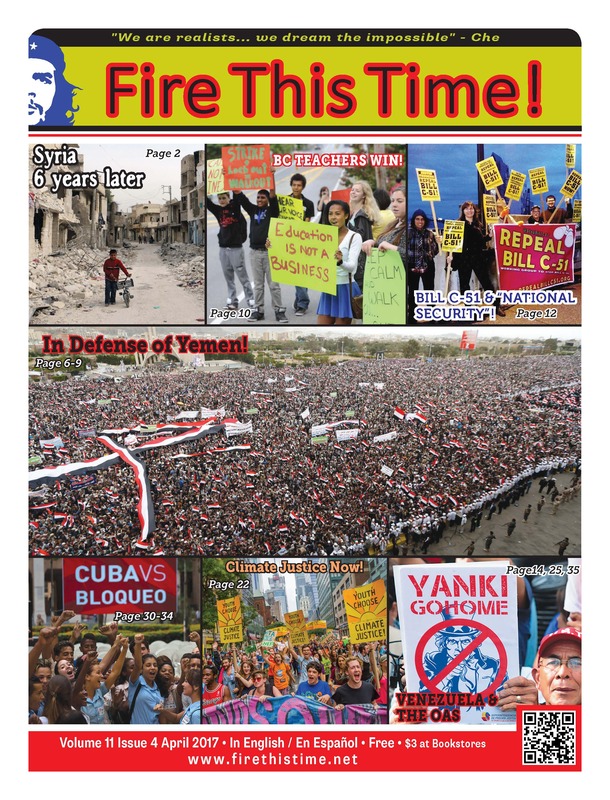 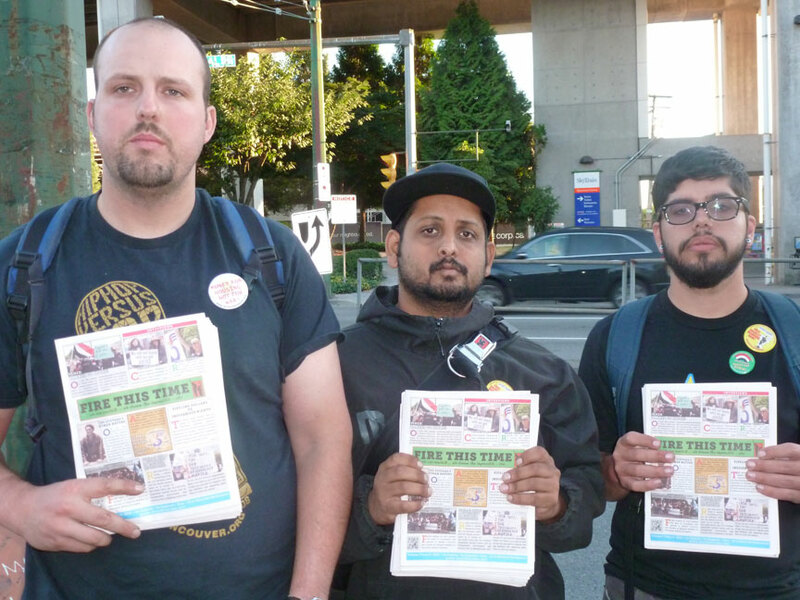 Fire This Time is an independent newspaper reflecting the struggles of oppressed people for building a new world. 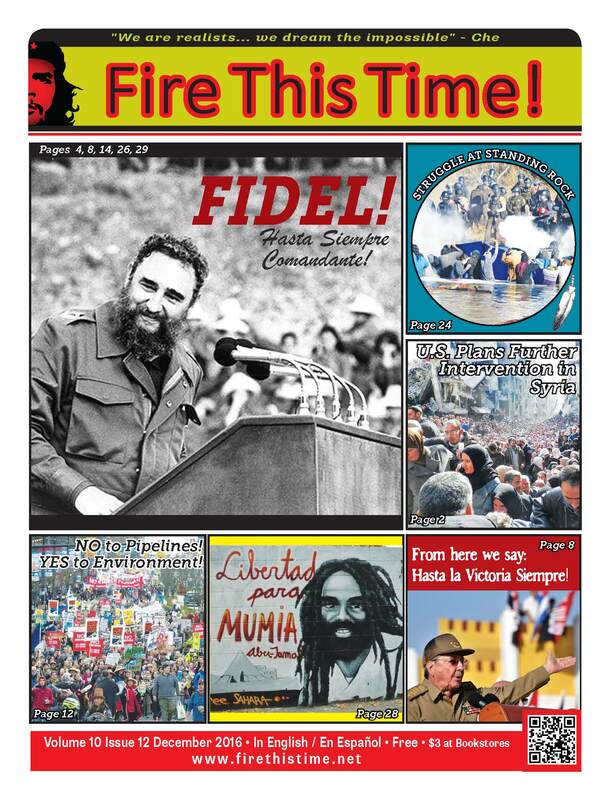 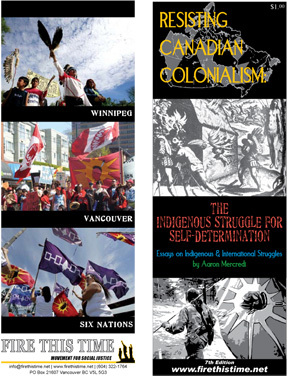 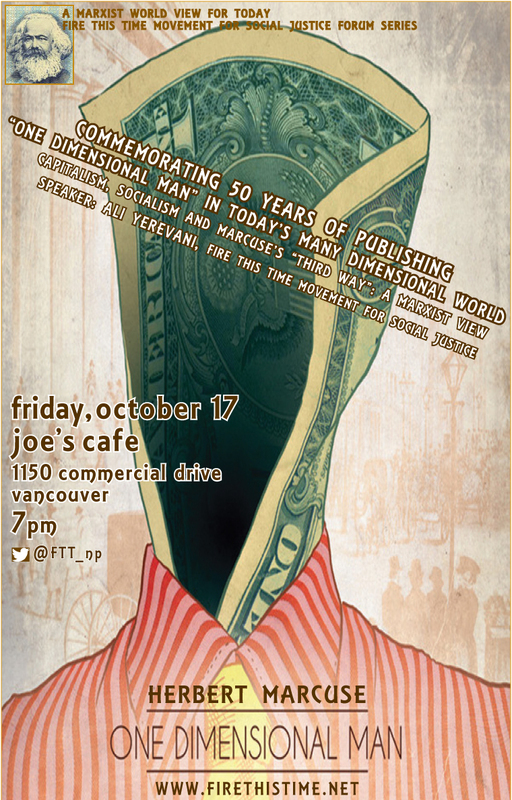 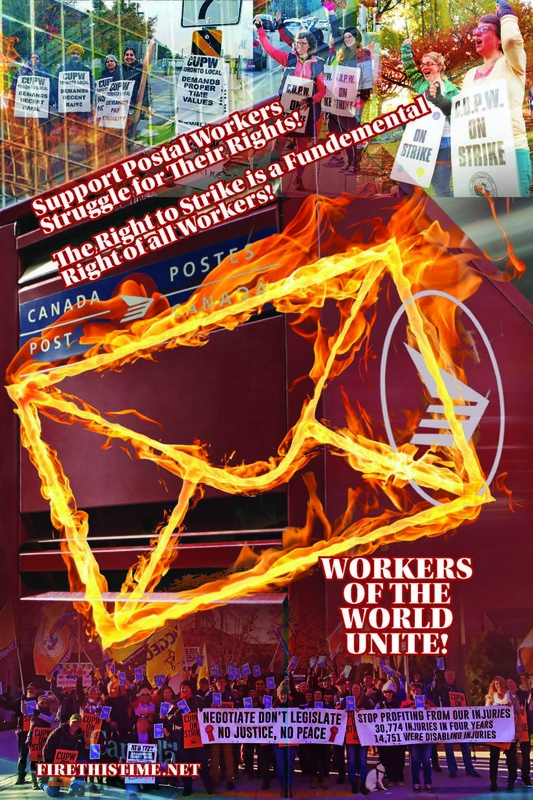 The Fire This Time Newspaper is supported solely through the individual donations from readers and supporters. 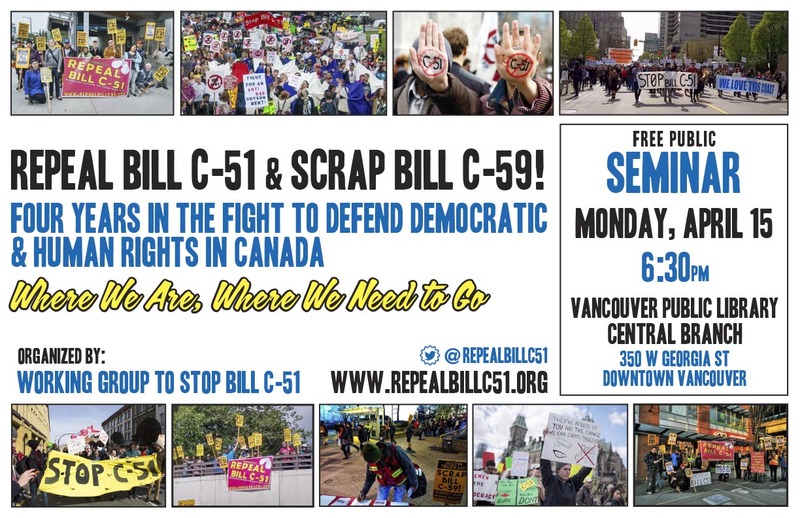 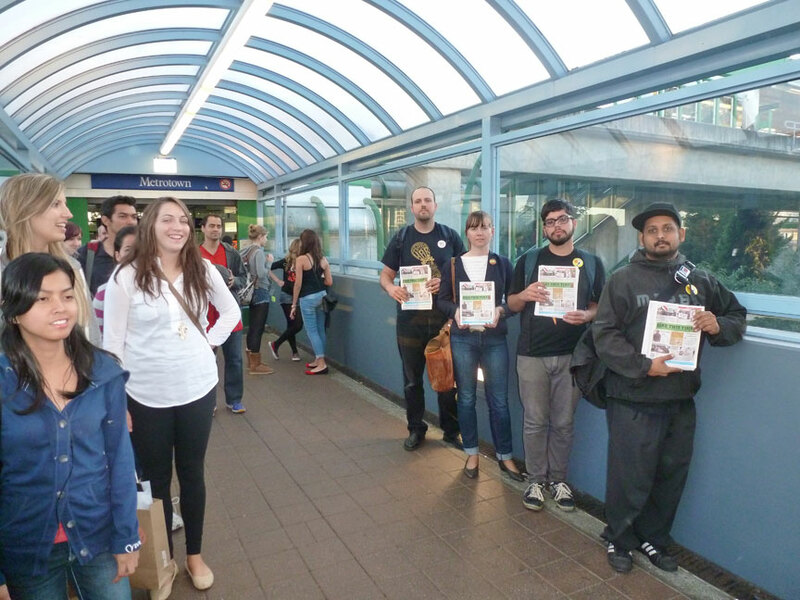 150 locations in the Lower Mainland! 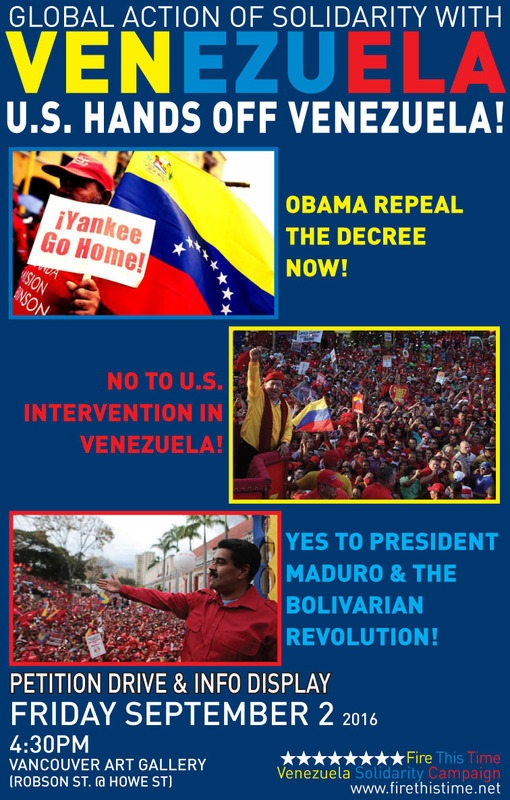 No more media lies against Venezuela! 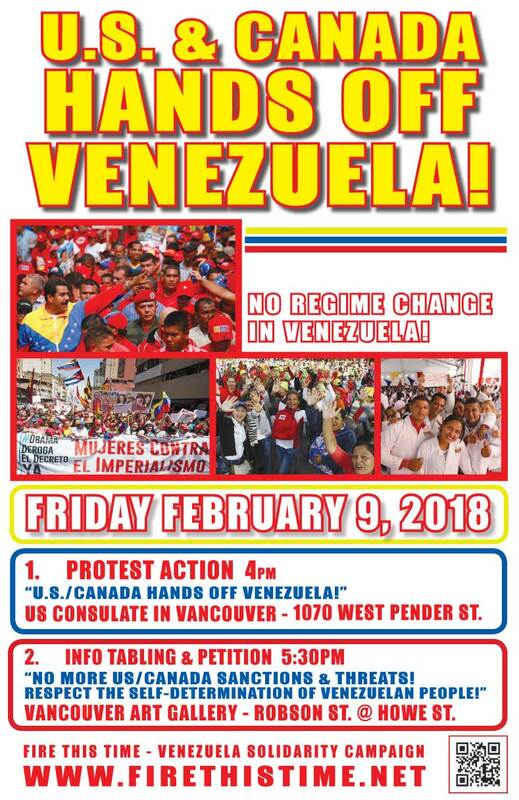 700 Hamilton St. @W. Georgia St. 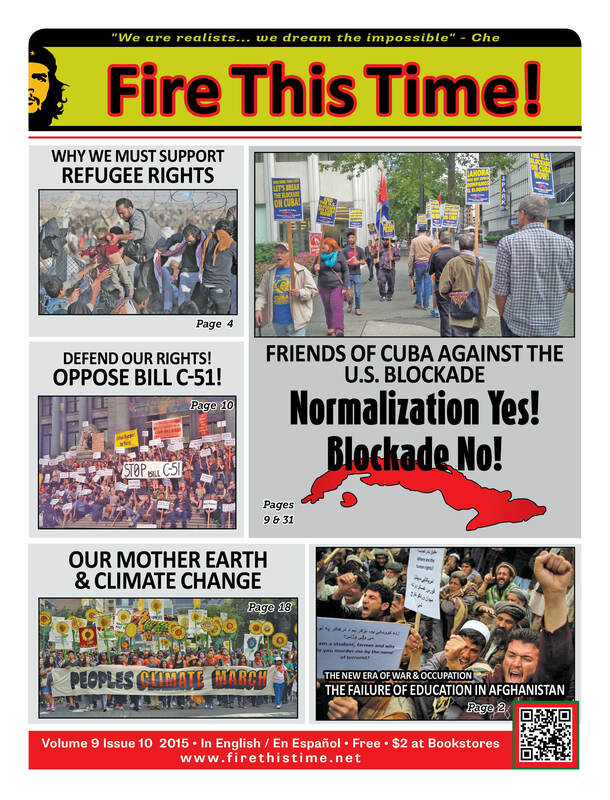 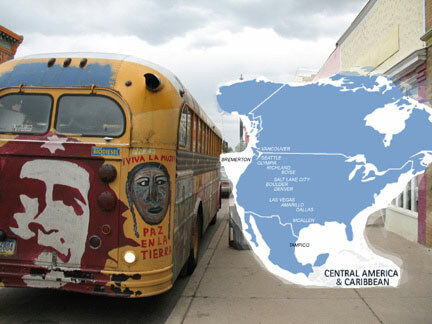 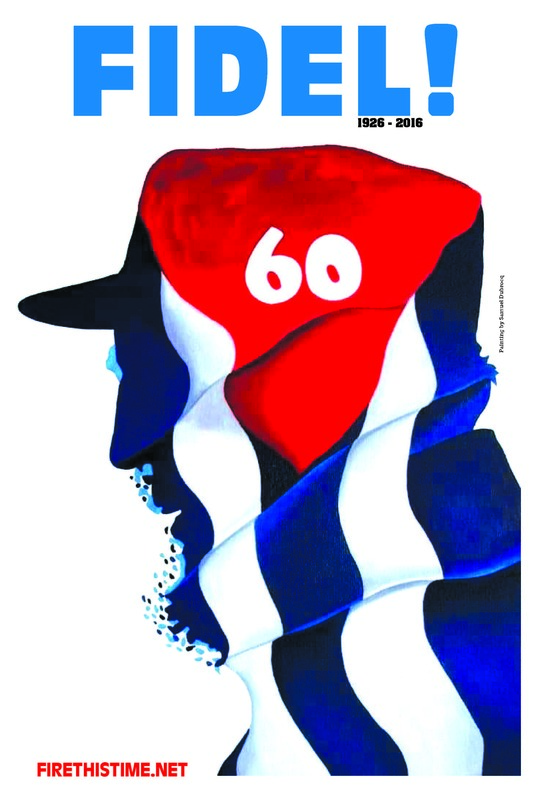 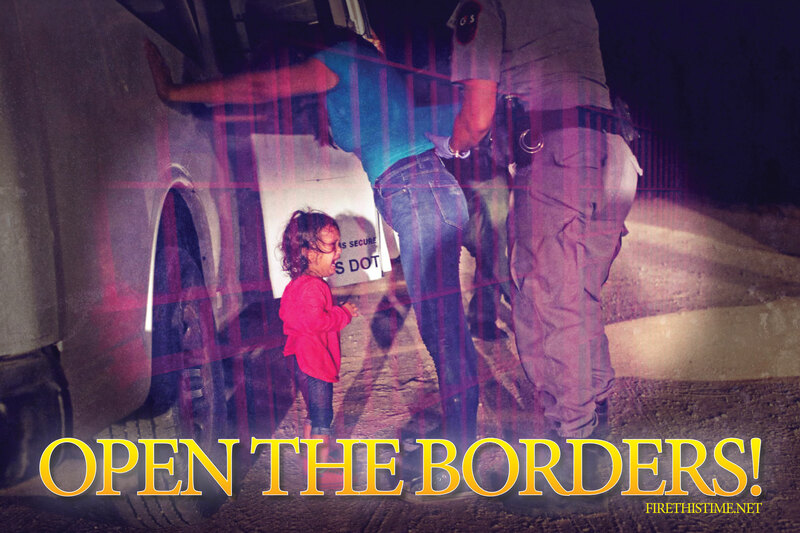 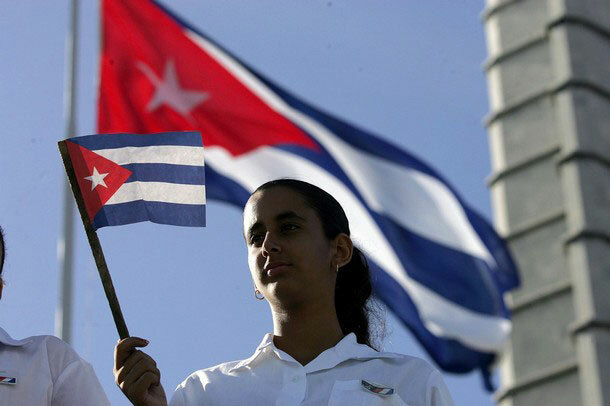 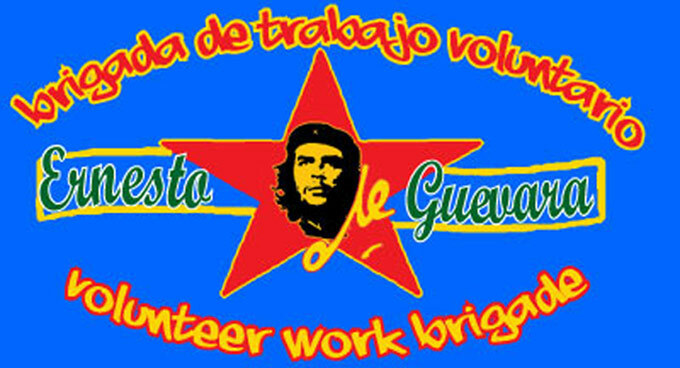 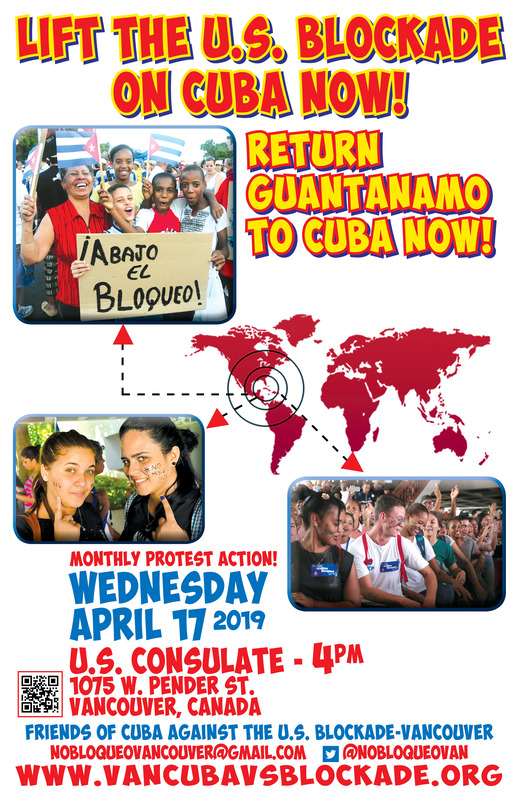 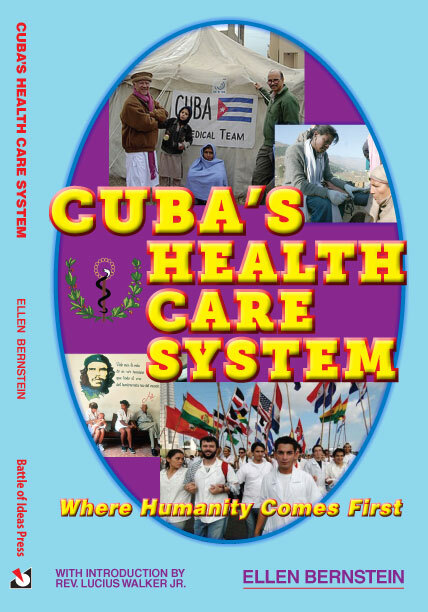 Lift The U.S. Blockade on Cuba Now! 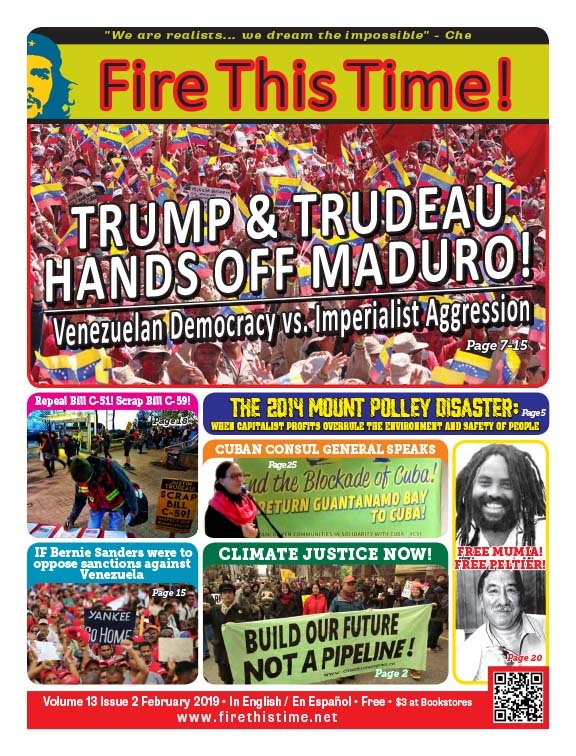 Trump & Trudeau Hands Off Maduro! 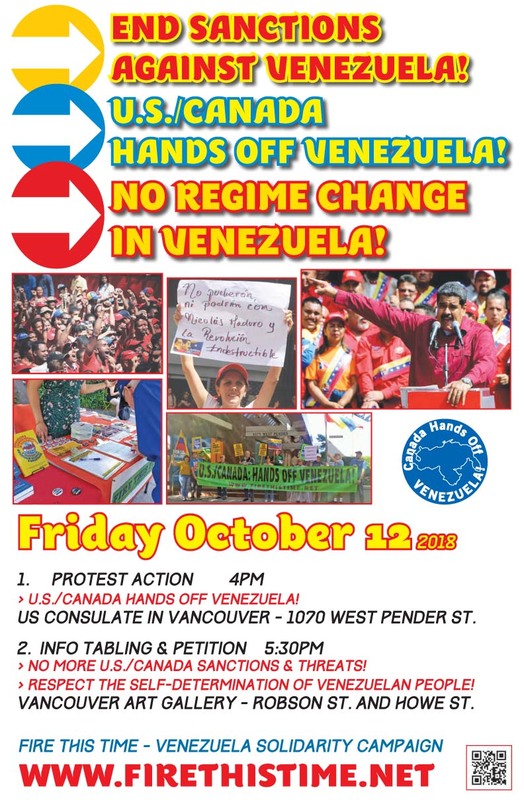 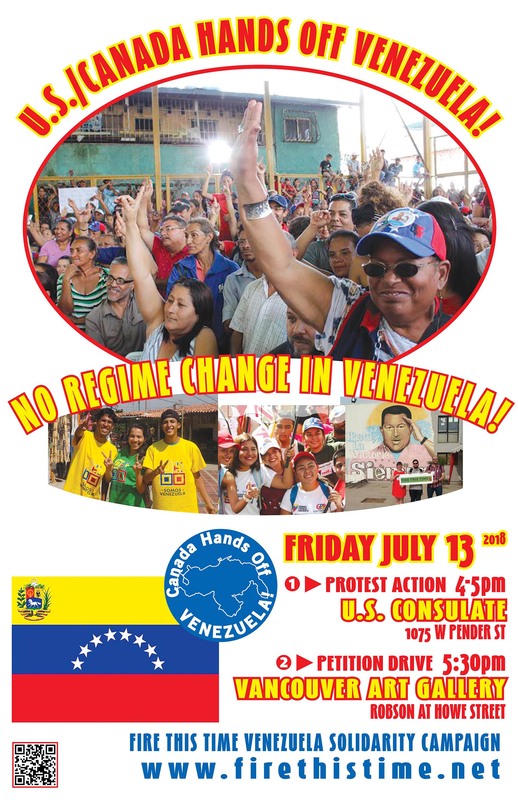 No Regime Change in Venezuela! 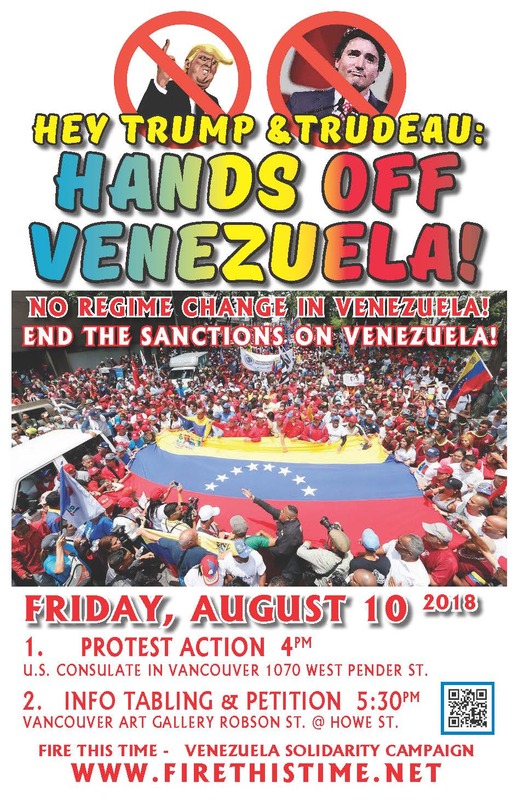 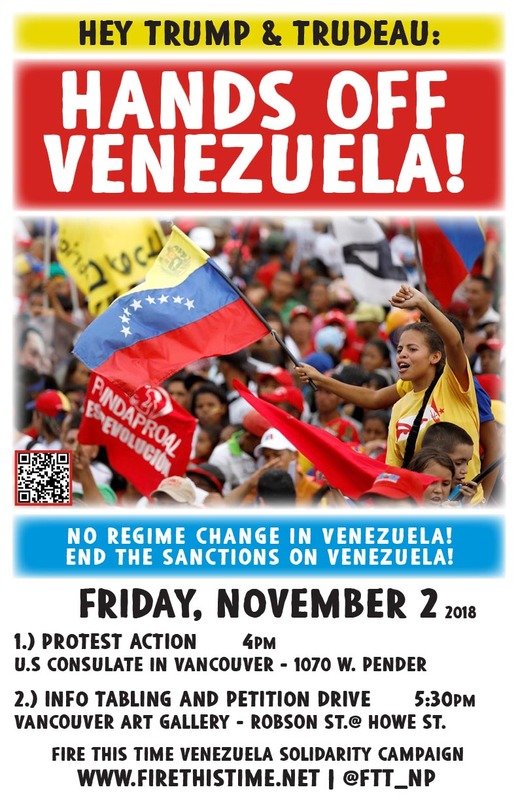 End the Sanctions on Venezuela! 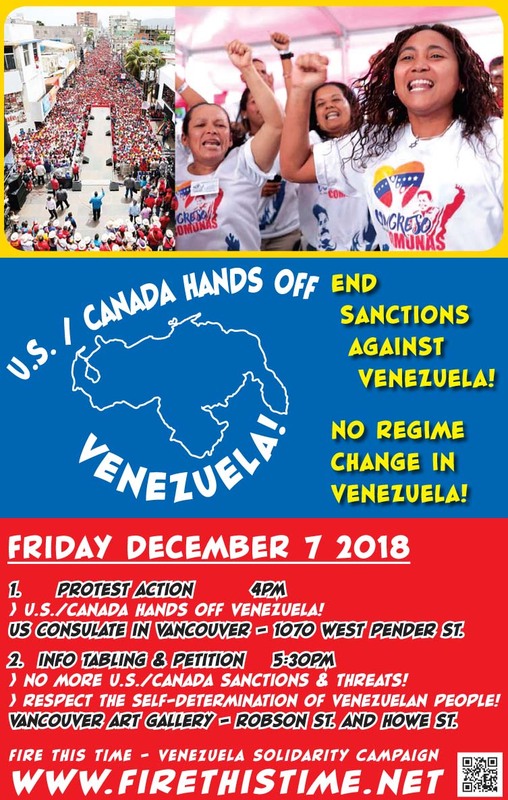 No More US/Canada Sanctions & Threats! 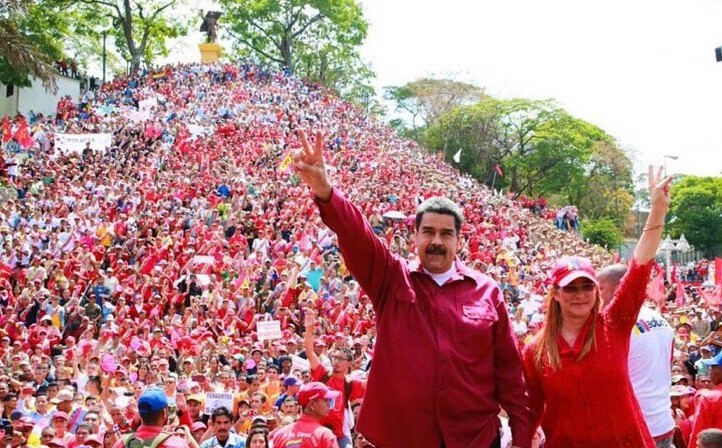 to the 2018 Presidential Elections in Venezuela! 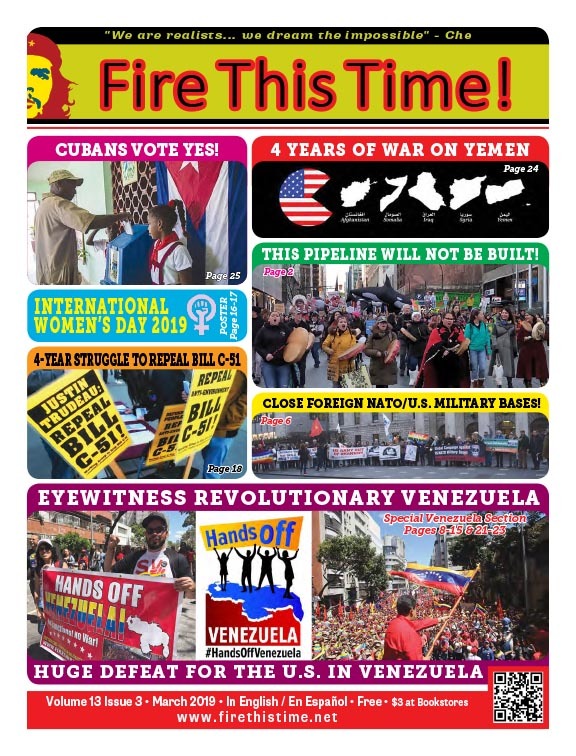 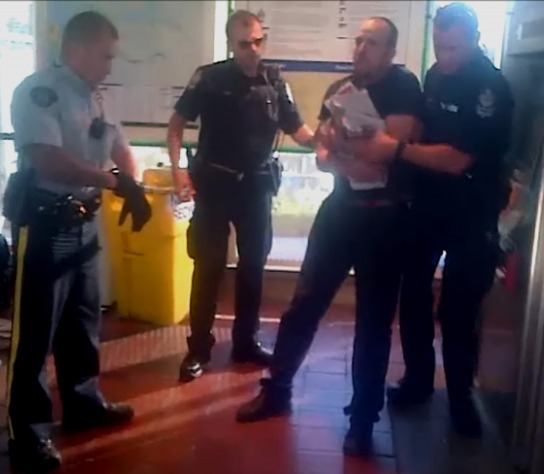 Click Here for a Report! 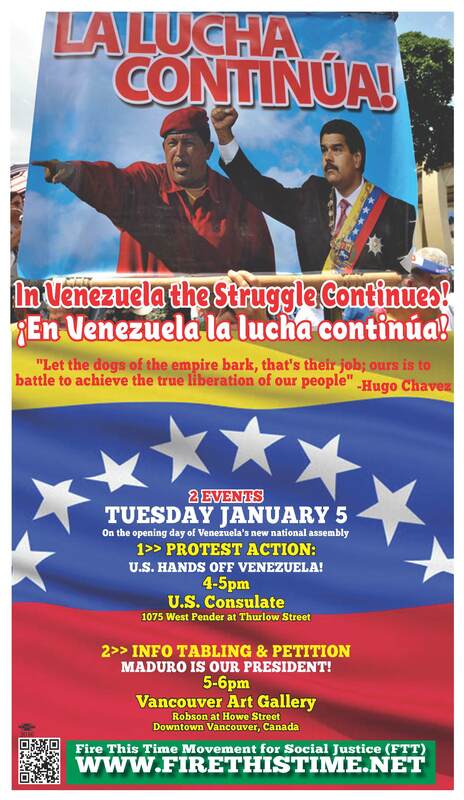 In Venezuela the Struggle Continues! 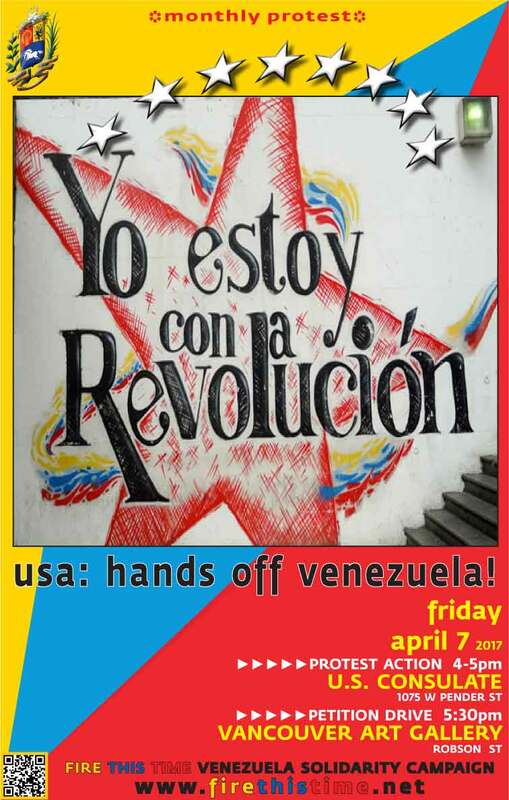 ¡En Venezuela la lucha continúa! 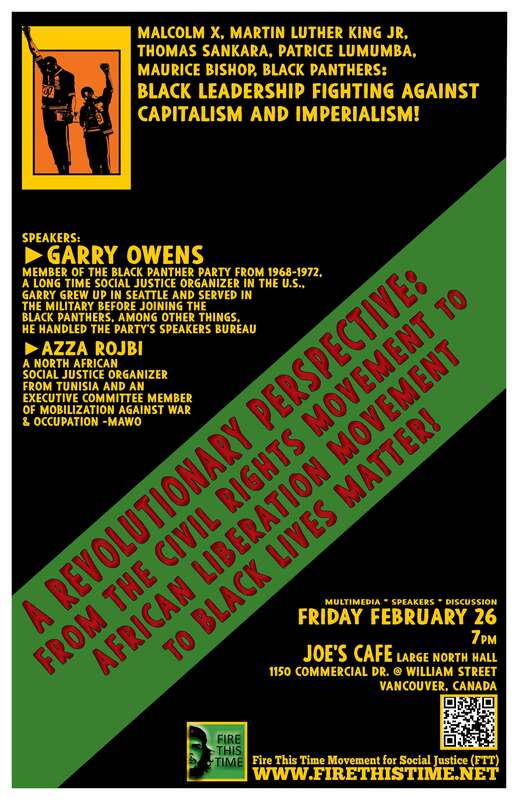 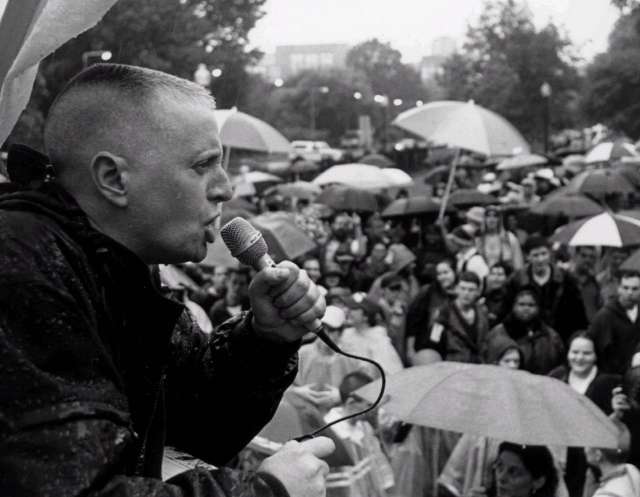 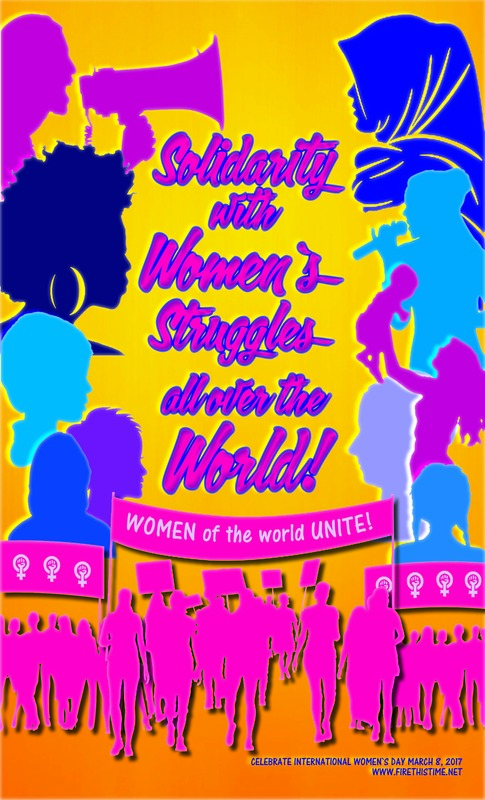 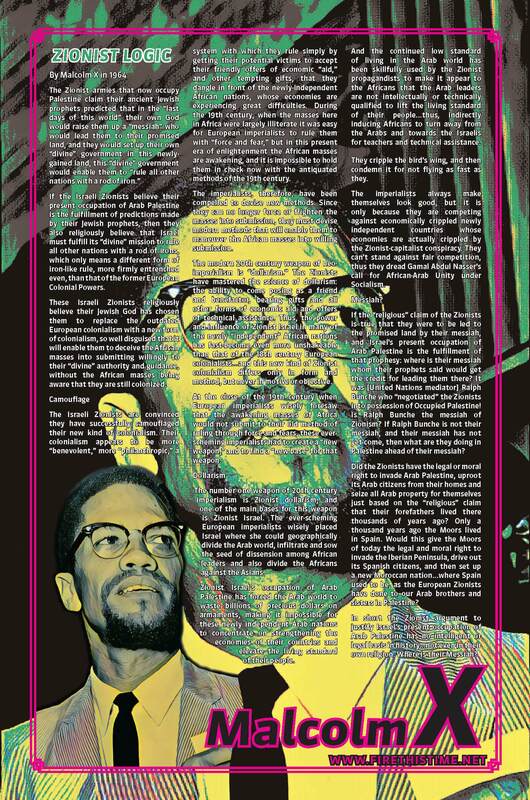 A Revolutionary Perspective: From the Civil Rights Movement to African Liberation Movement to Black Lives Matter! 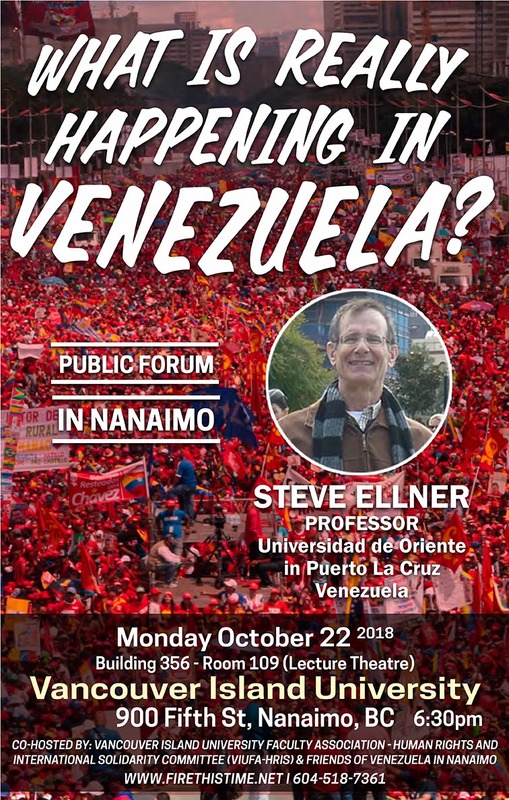 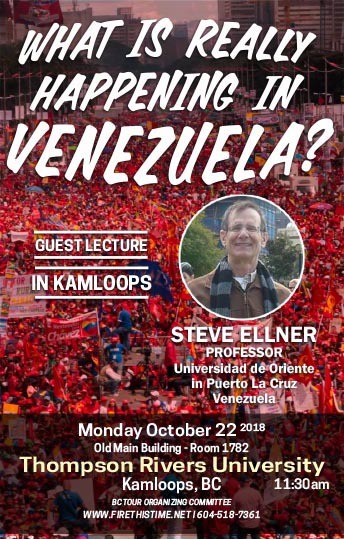 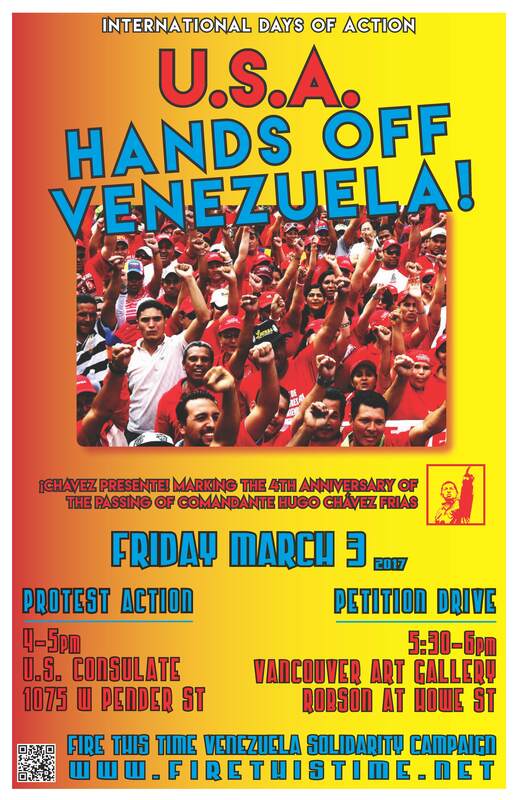 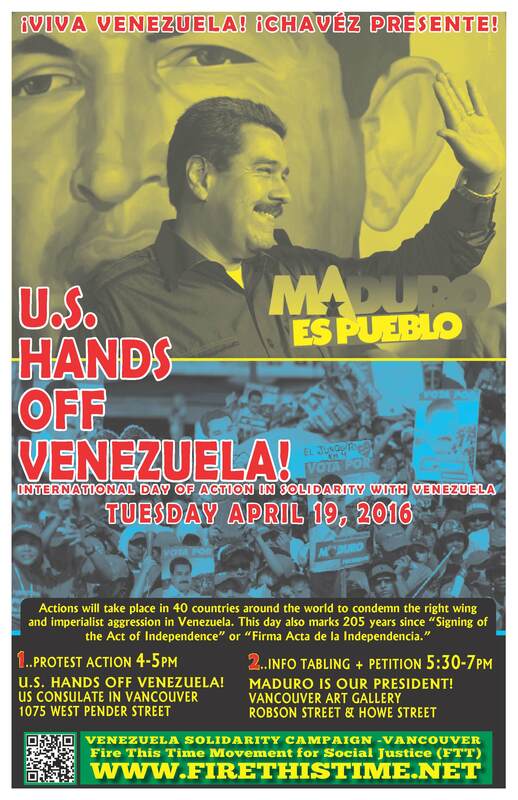 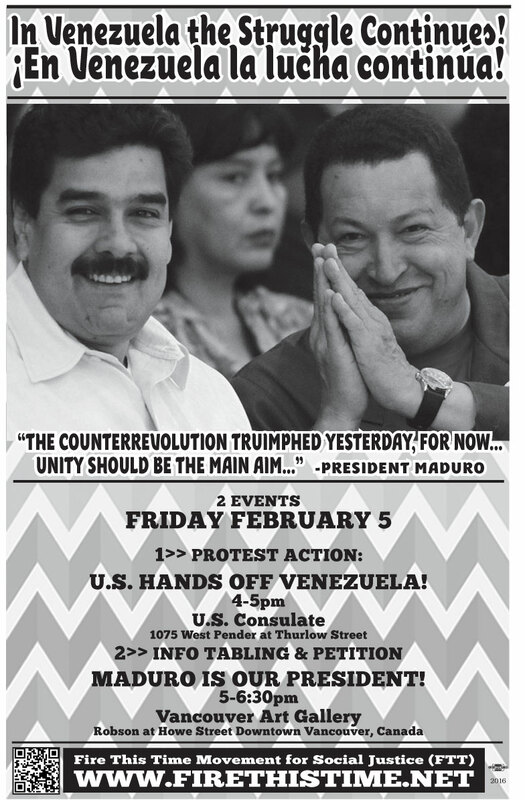 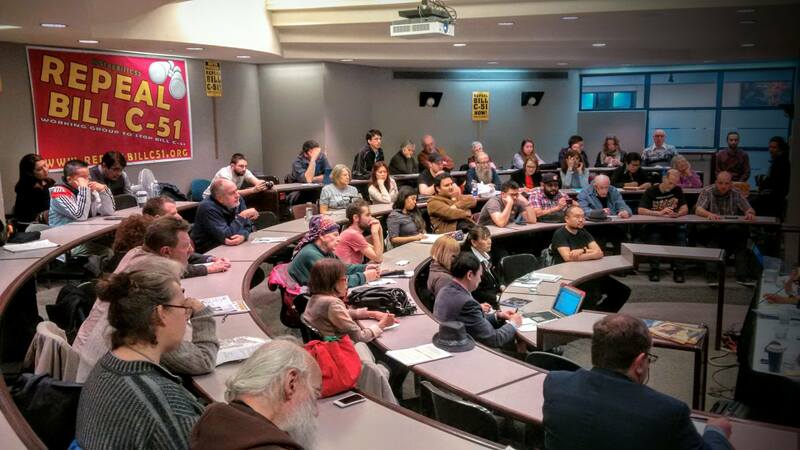 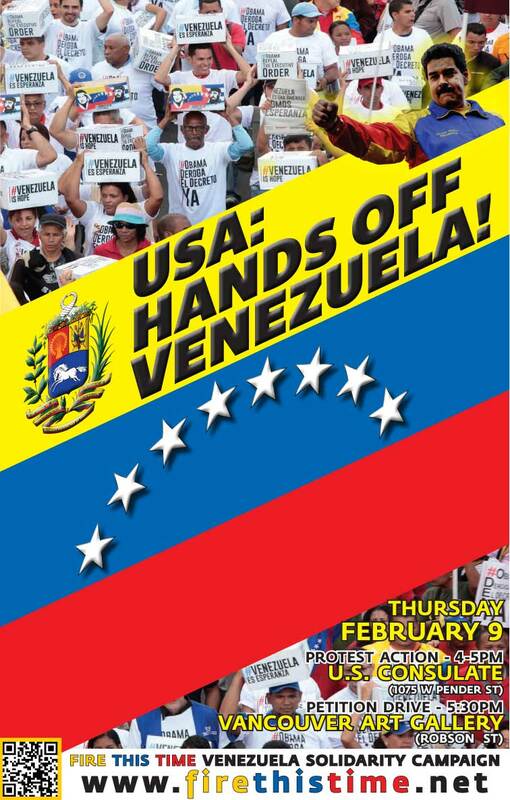 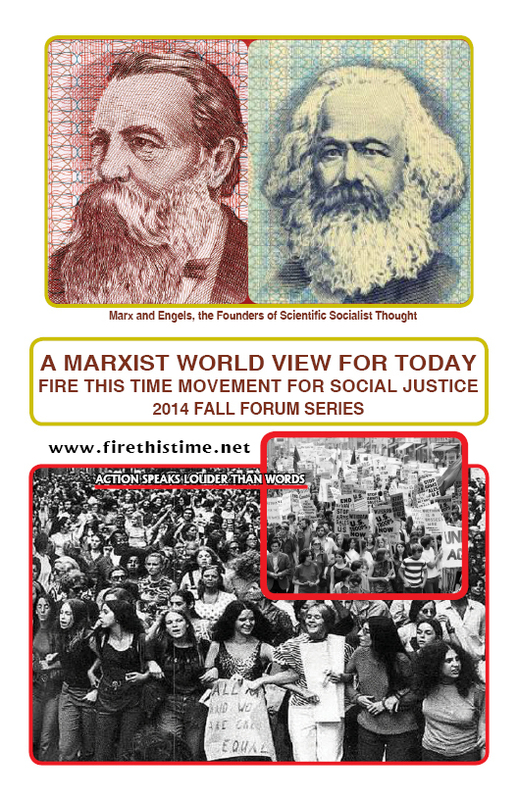 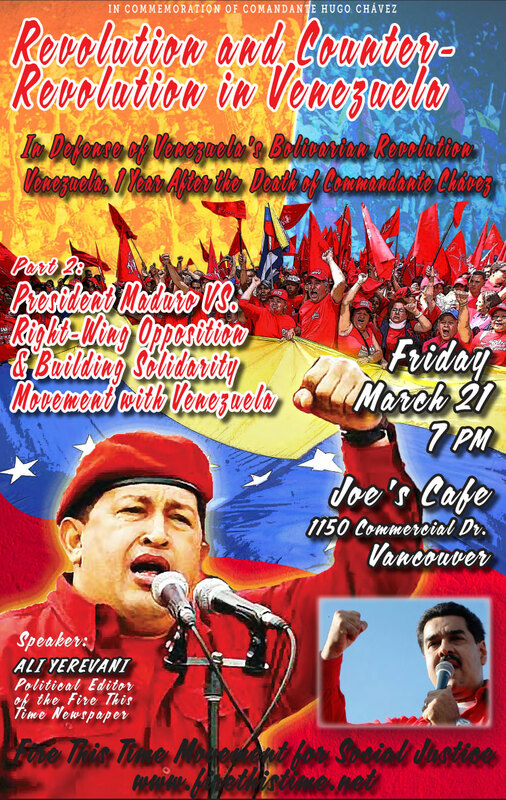 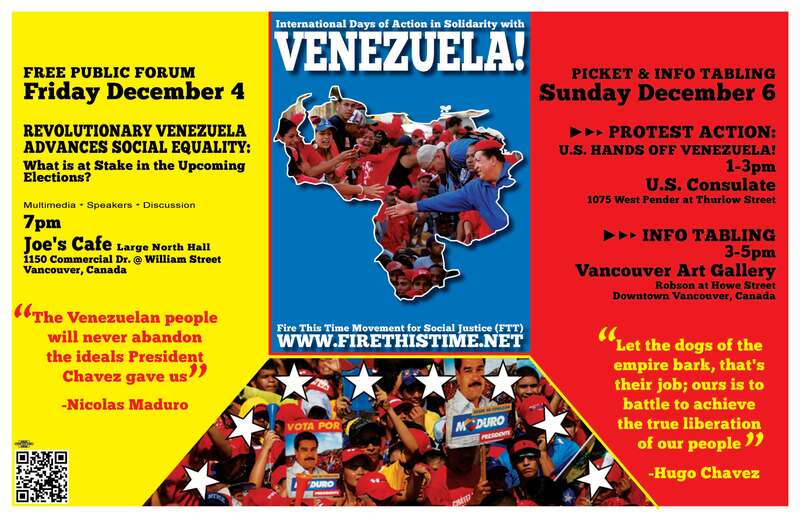 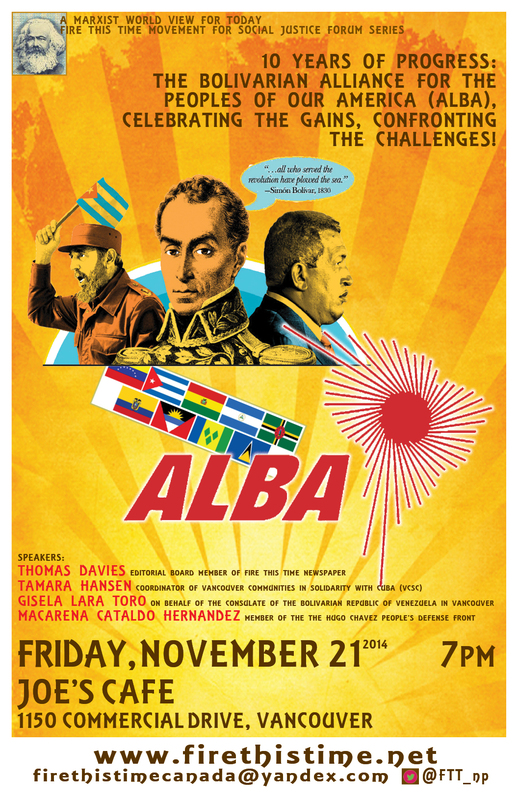 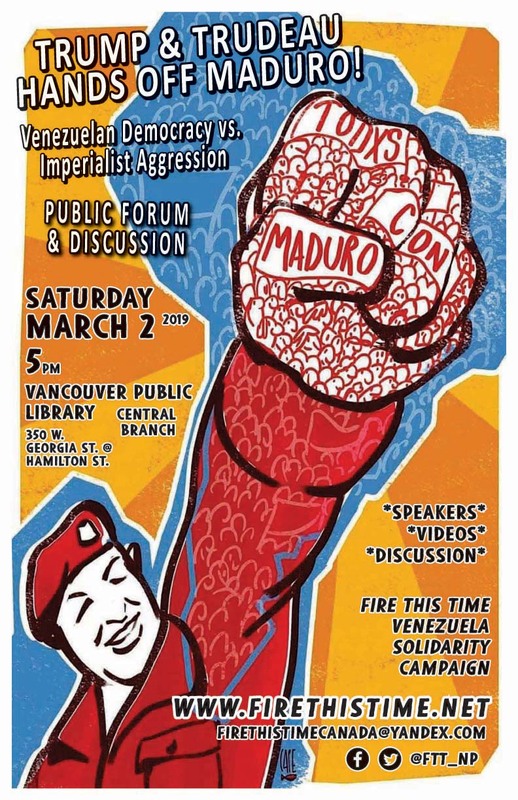 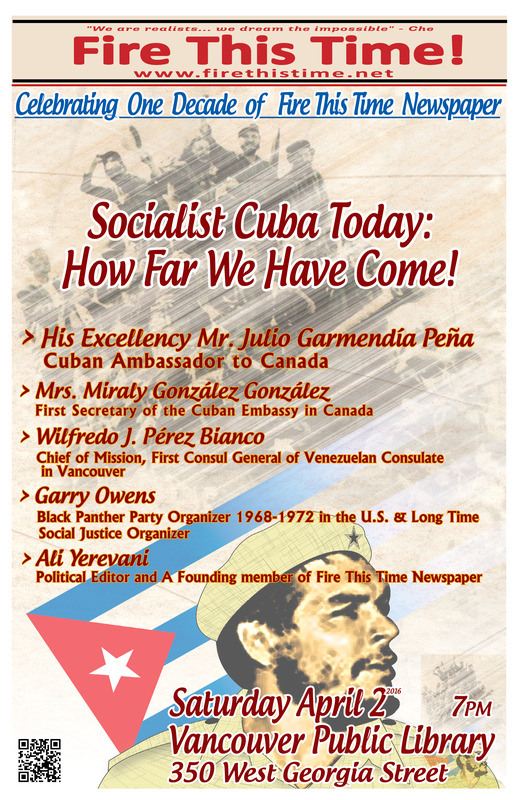 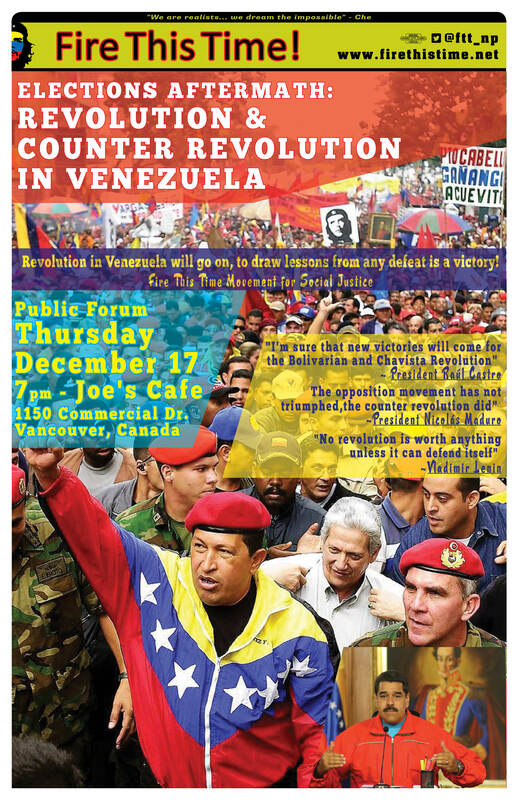 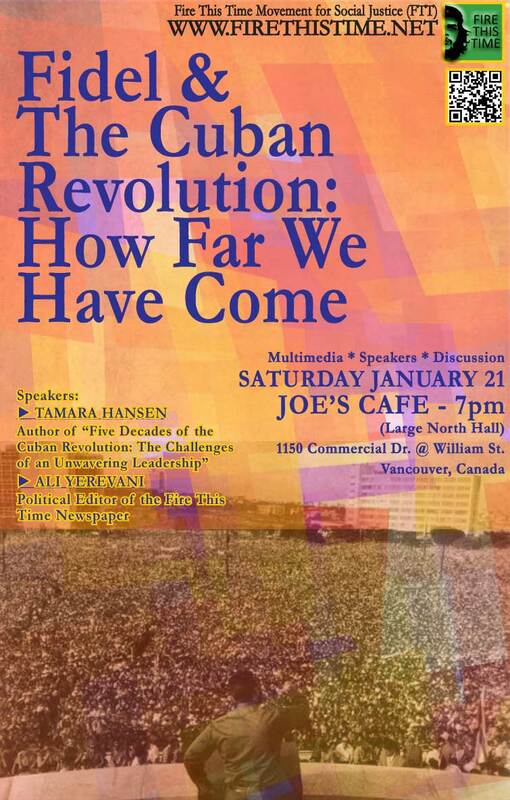 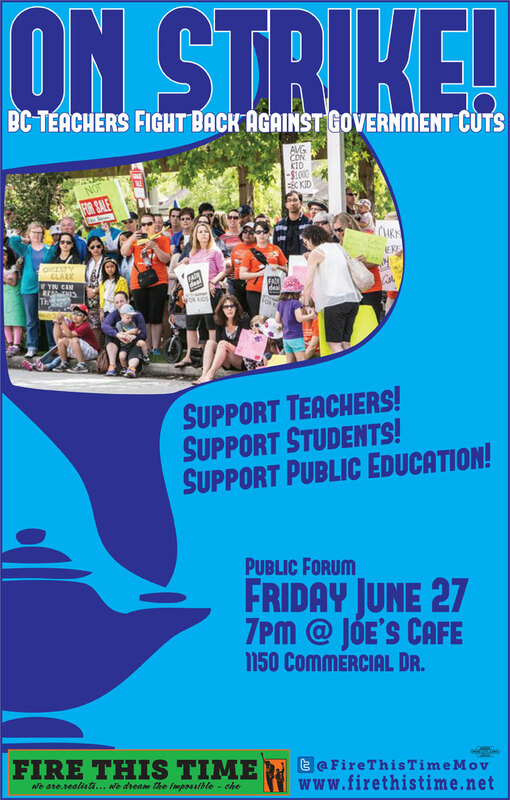 <<2>> Free Public Forum - Revolutionary Venezuela Advances Social Equality: What is at Stake in the Upcoming Elections? 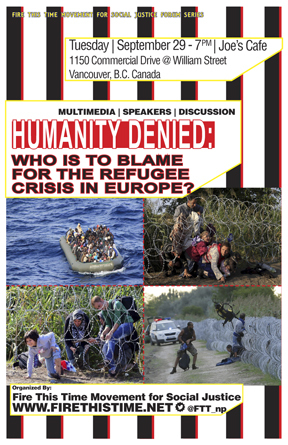 Who is to Blame for the Refugee Crisis in Europe? 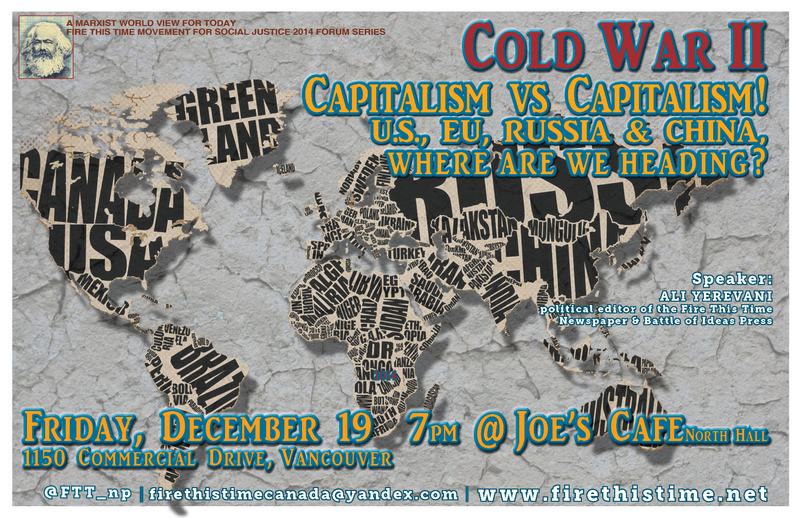 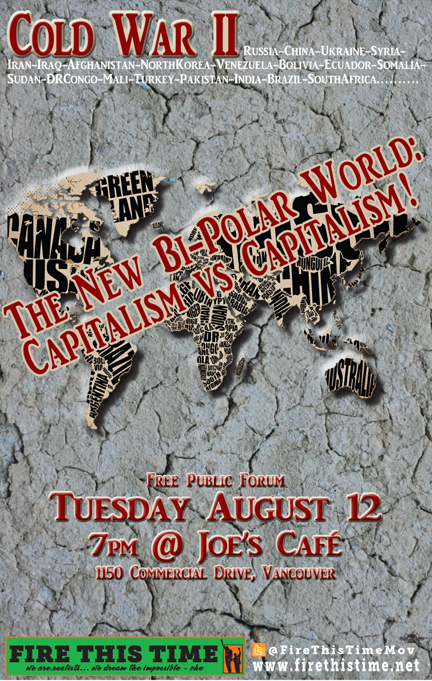 Cold War II: Capitalism Vs. Capitalism! 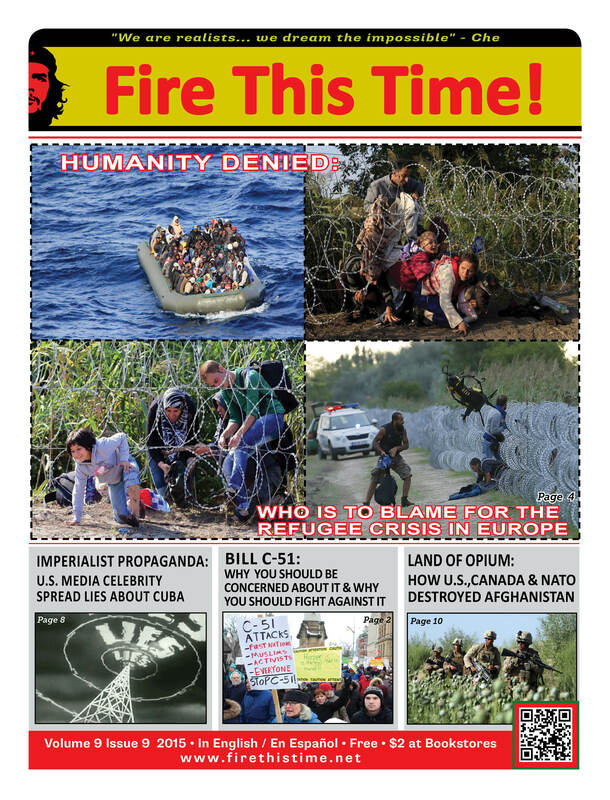 U.S., EU, RUSSIA & CHINA, Where are We Heading? 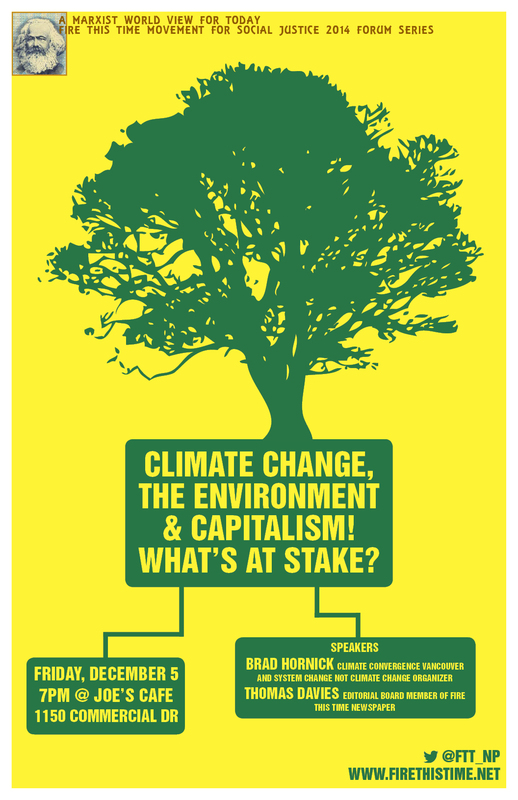 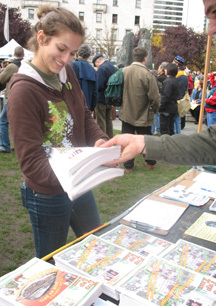 Climate Change, the Environment and Capitalism. 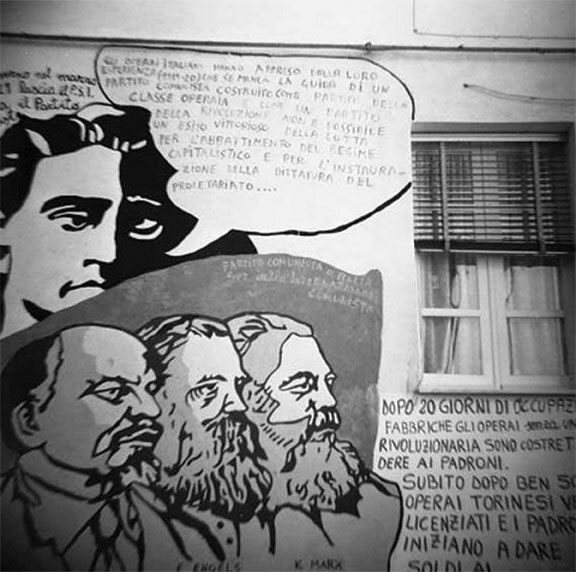 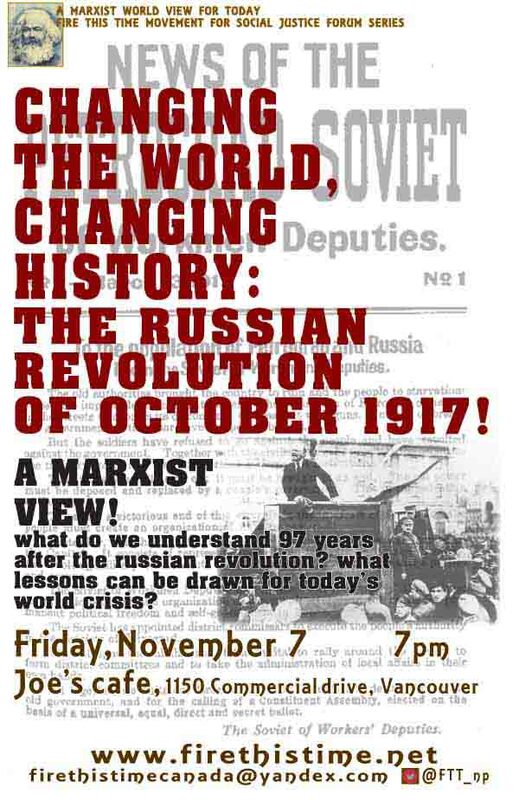 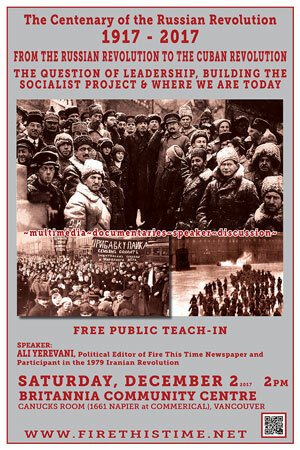 What do we understand 97 years after the Russian Revolution? 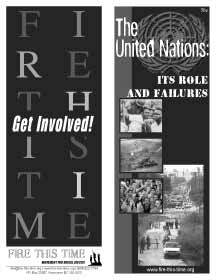 What lessons can be drawn for today’s world crisis? 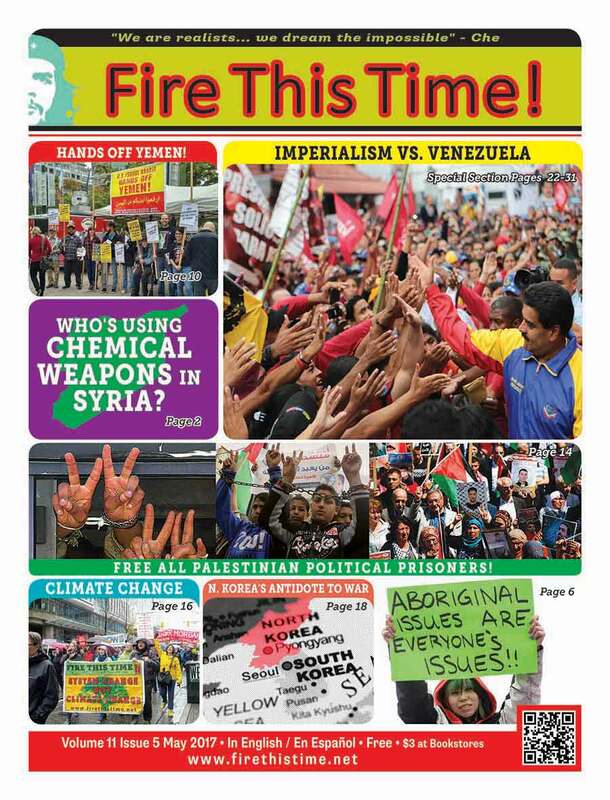 Somalia- Sudan-DRCongo-Mali-Turkey-Pakistan-India-Brazil-SouthAfrica. . . . . . . . . .
One Year After the Gezi Park Mass Protests! 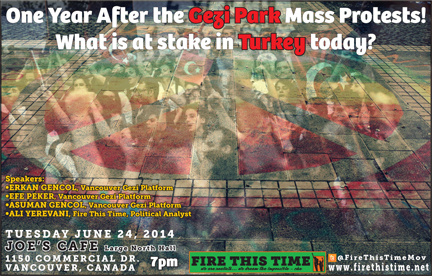 What is at Stake in Turkey Today? 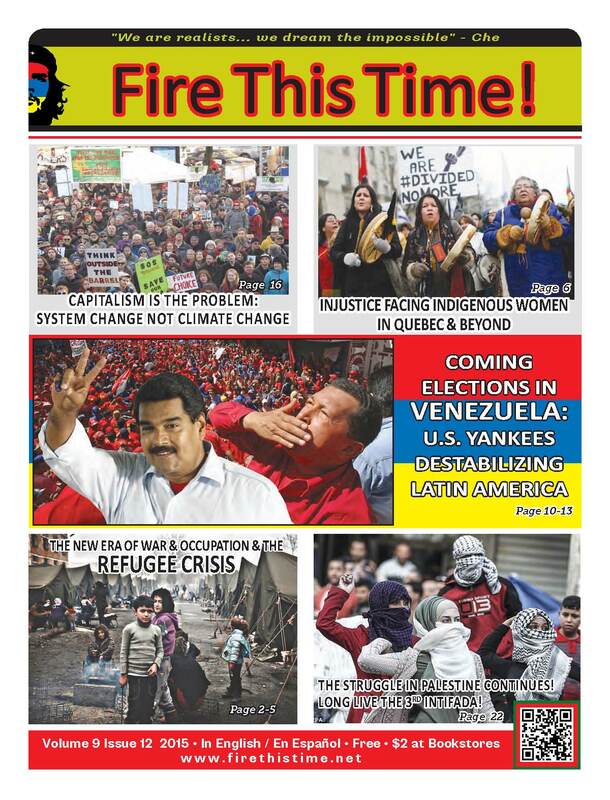 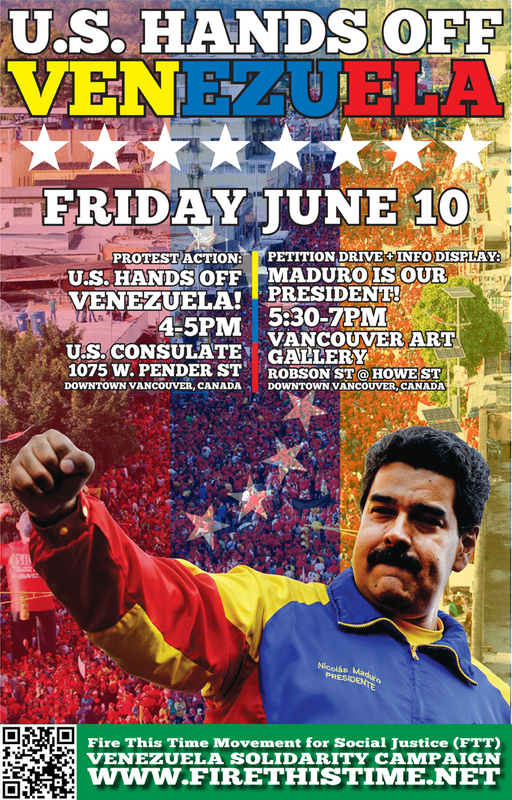 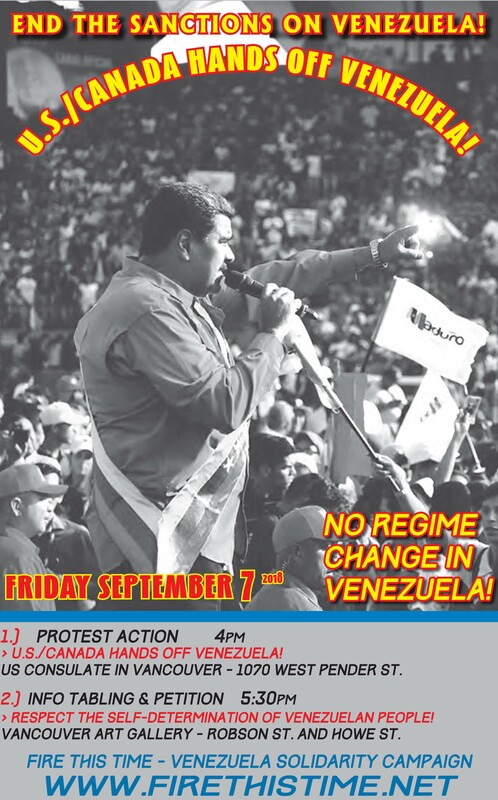 Fire This Time Movement for Social Justice Venezuela Solidarity Campaign Condemns the Assassination Attempt on President Nicolas Maduro! 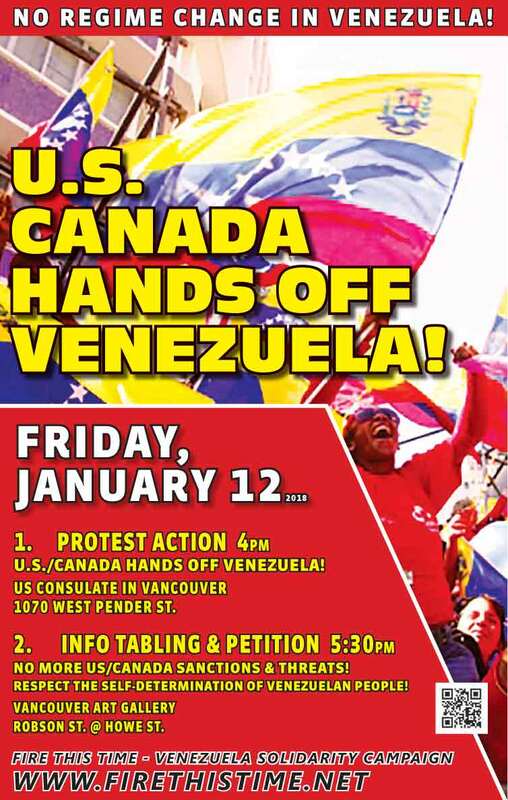 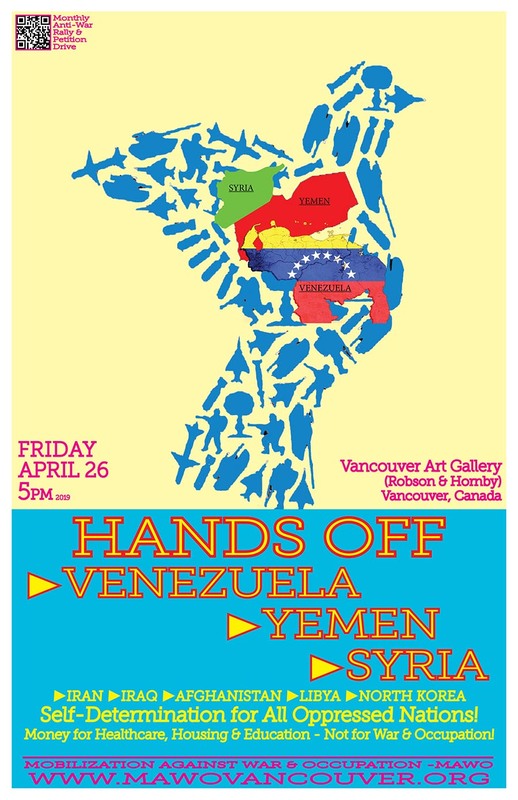 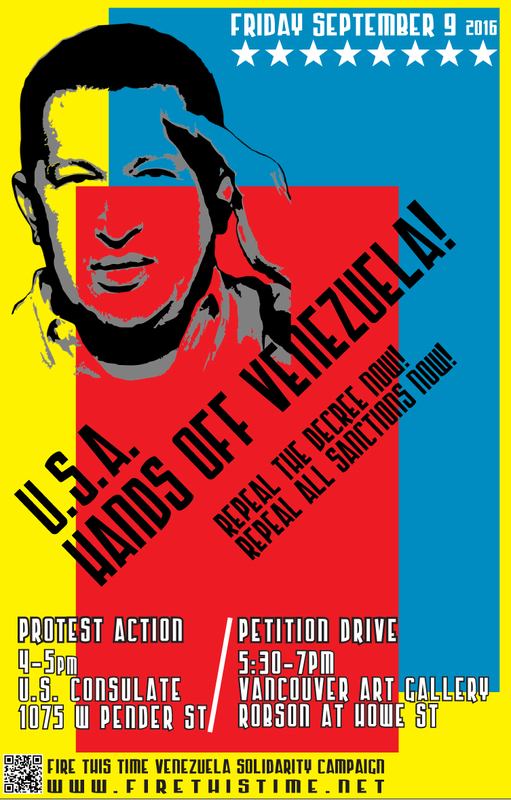 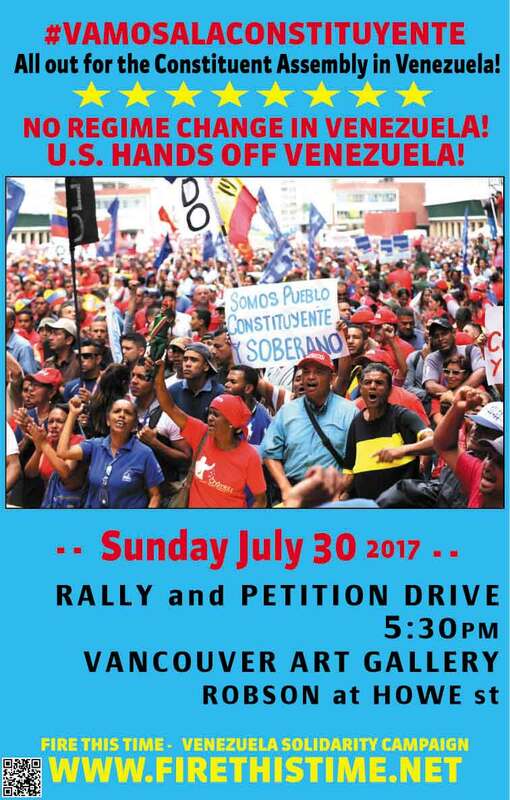 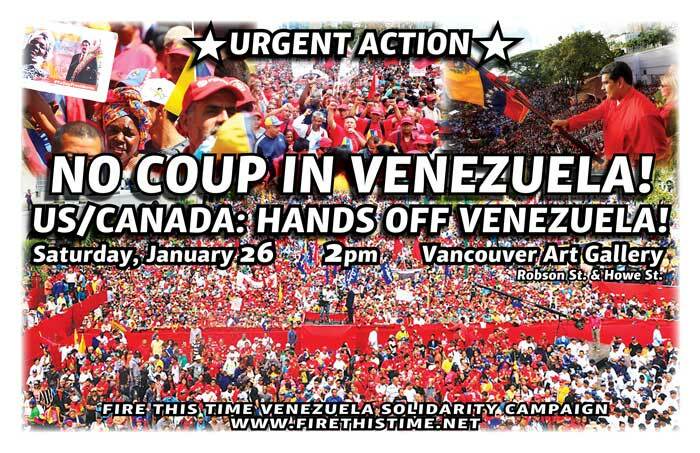 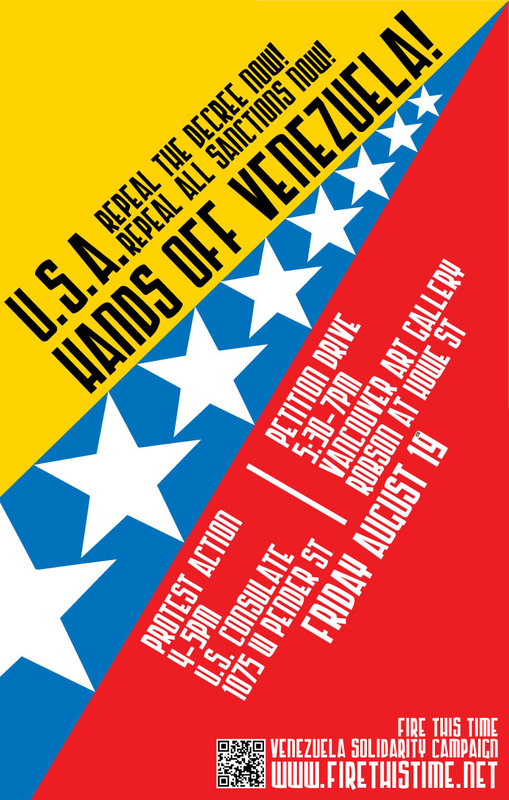 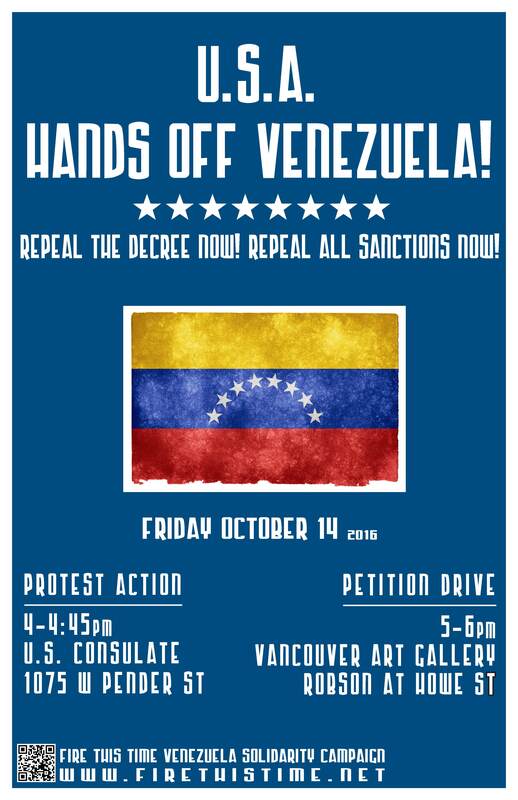 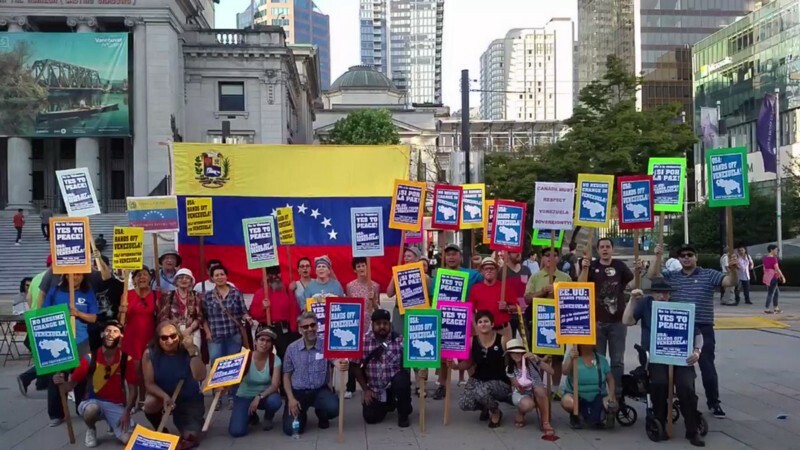 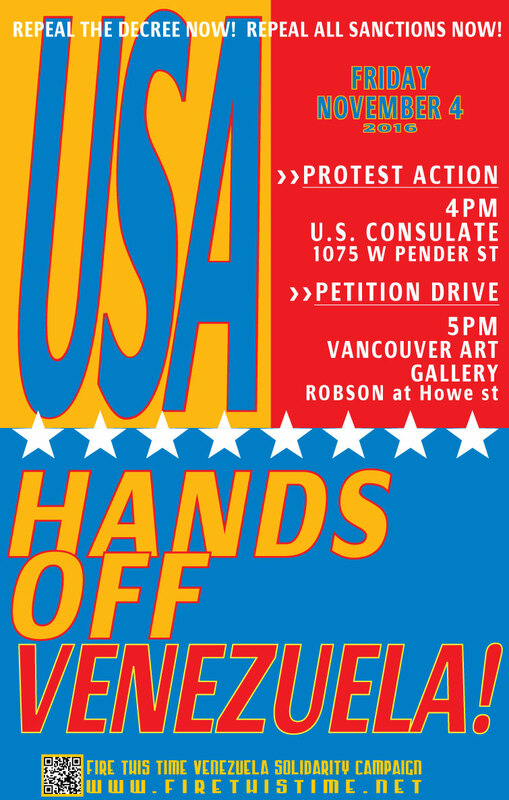 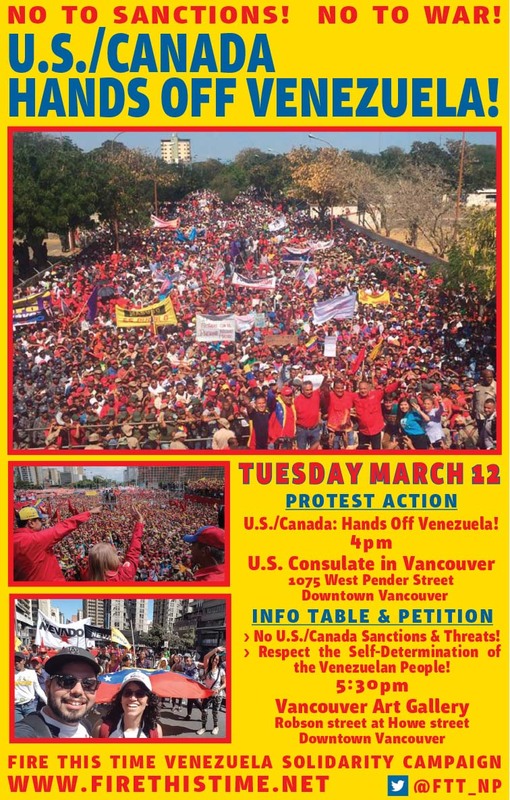 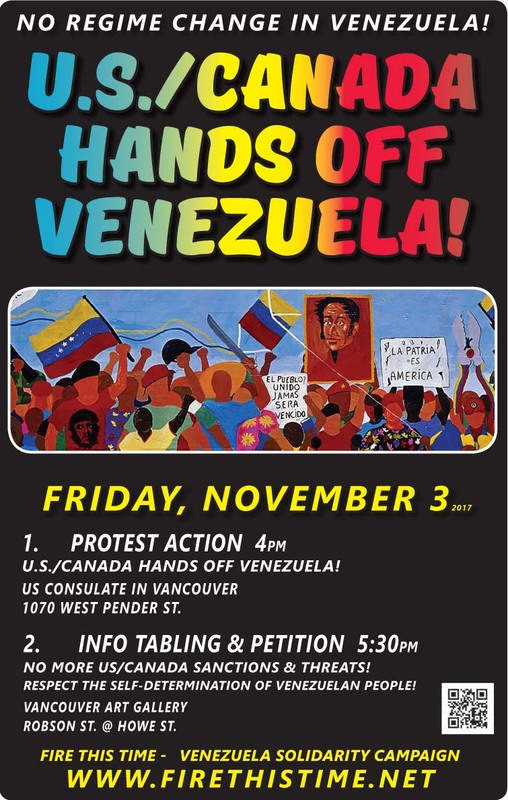 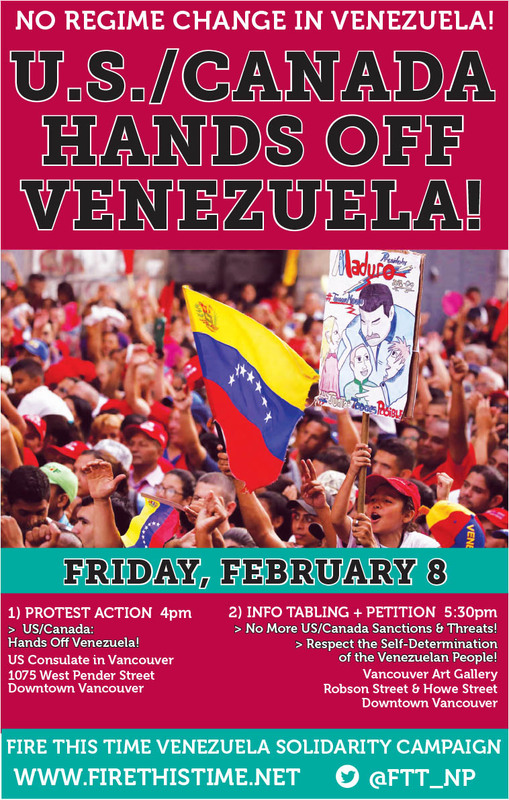 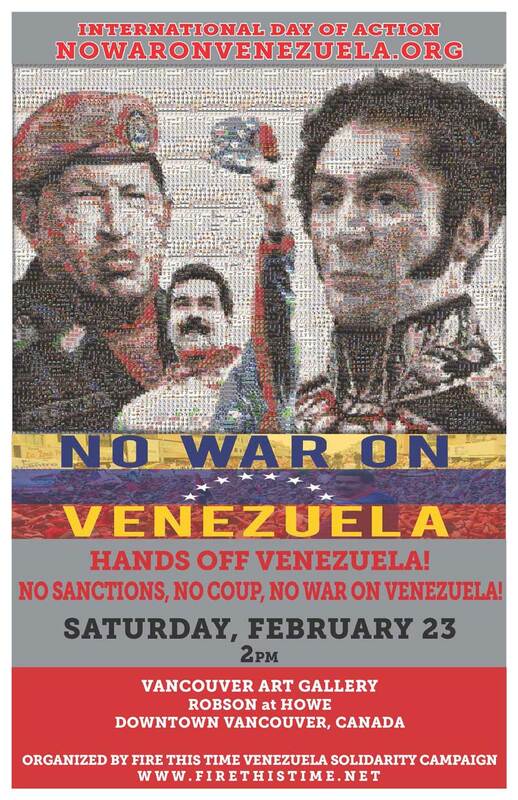 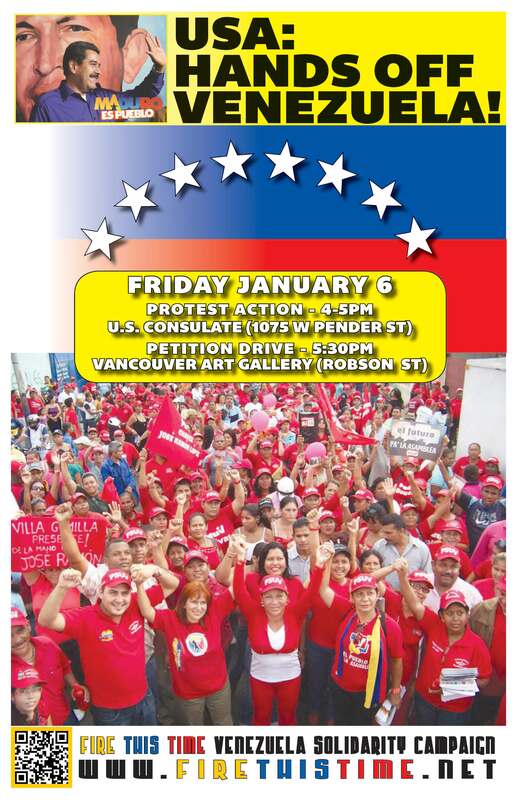 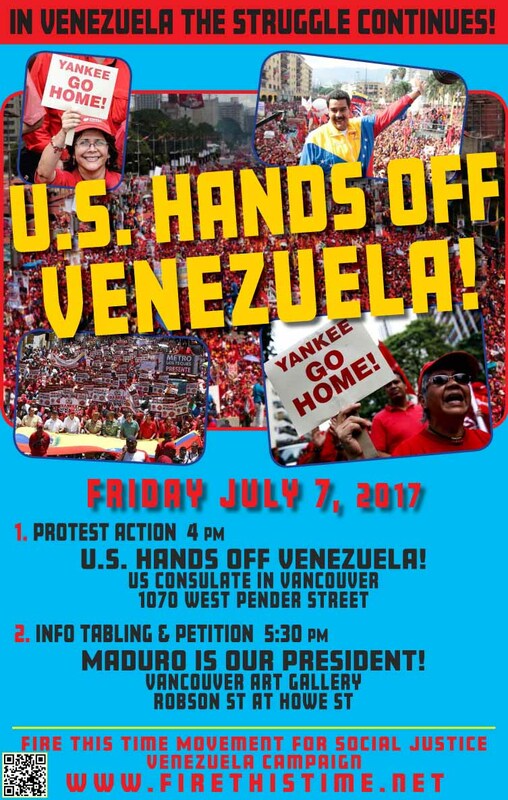 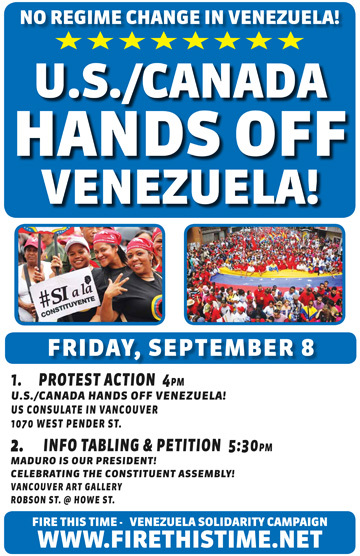 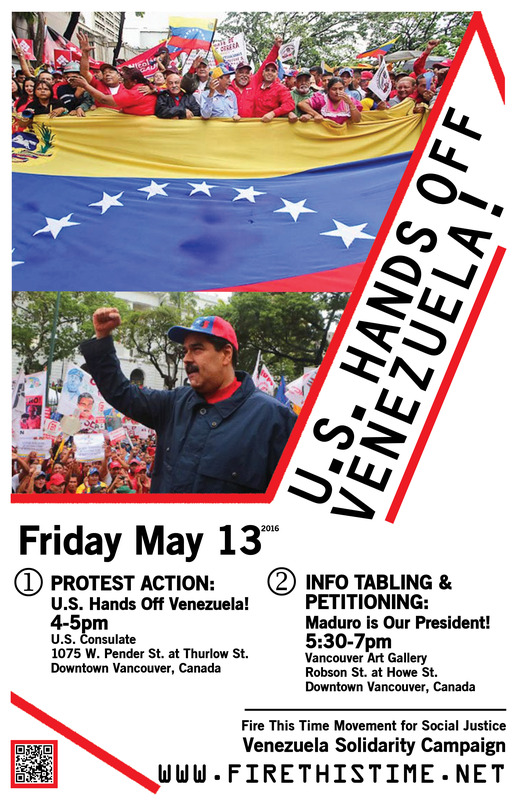 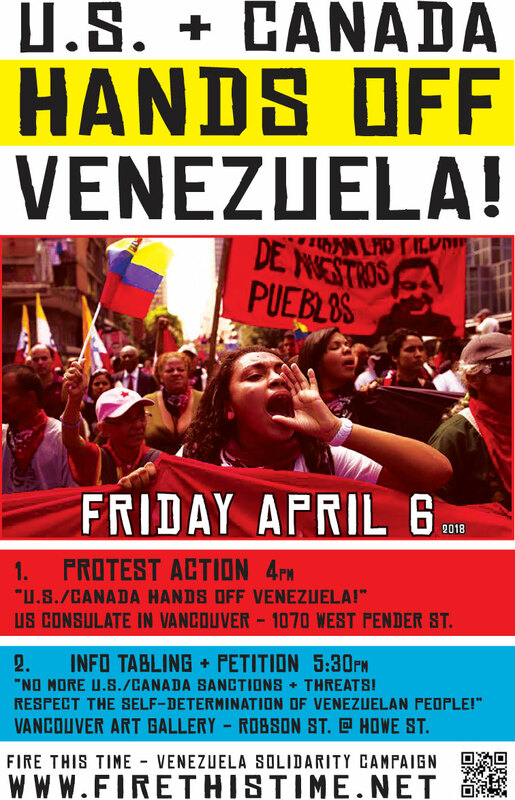 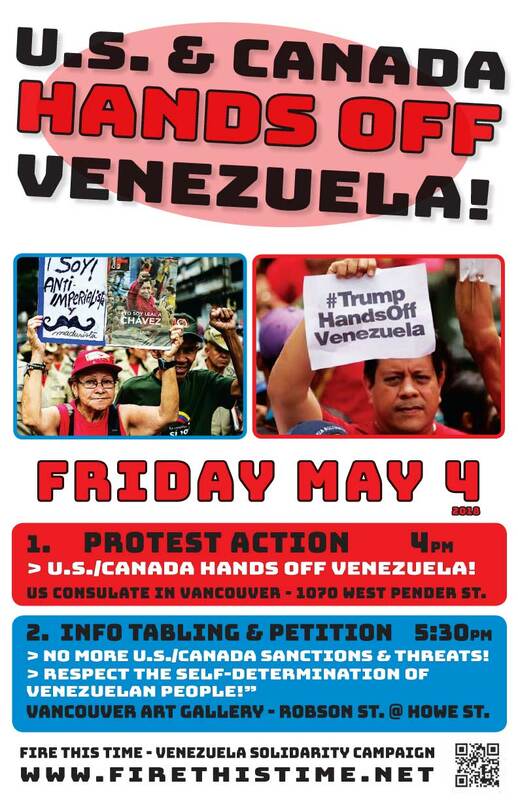 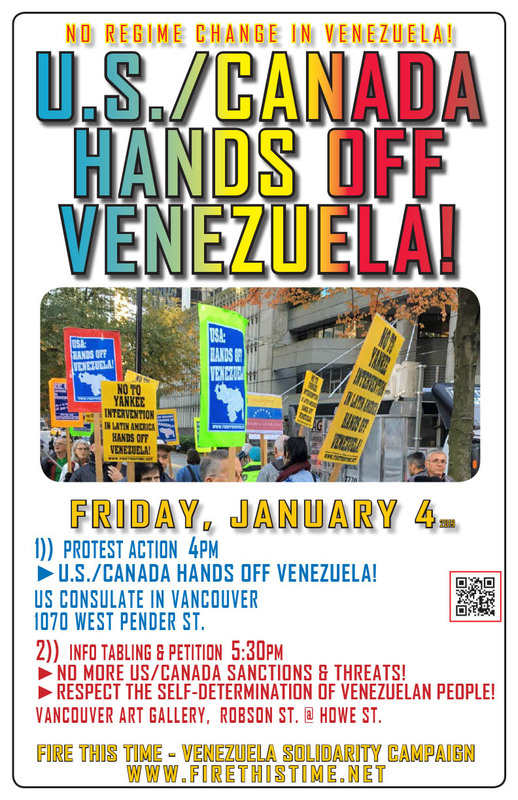 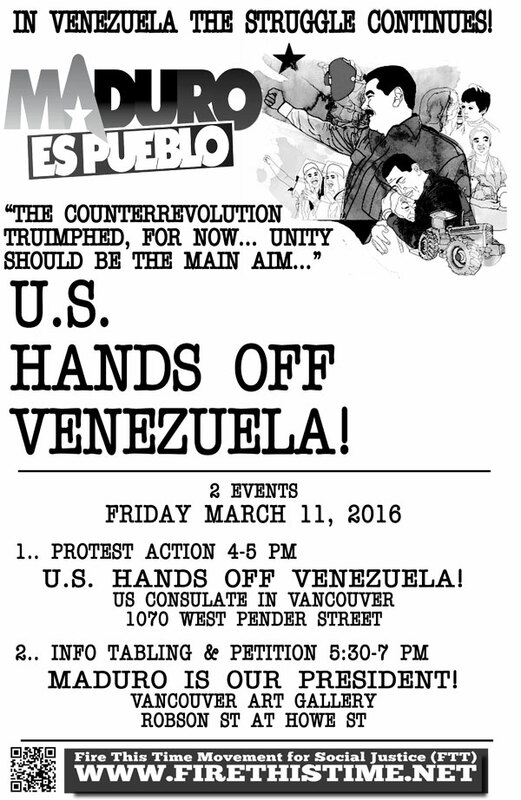 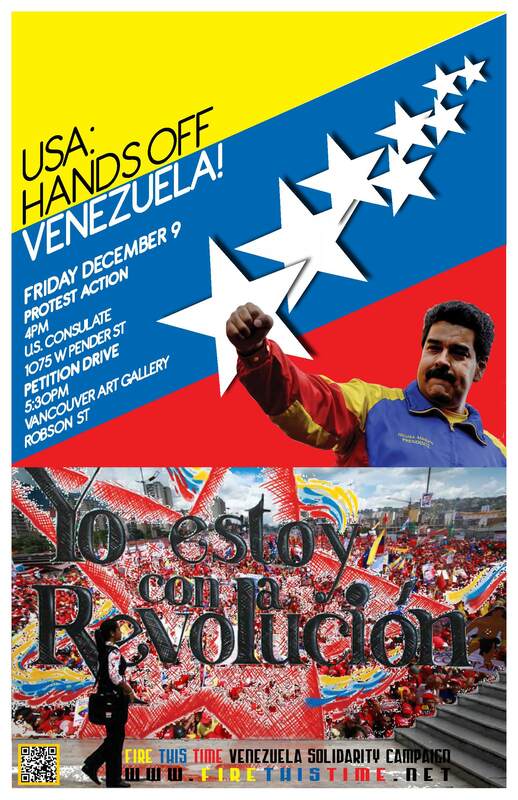 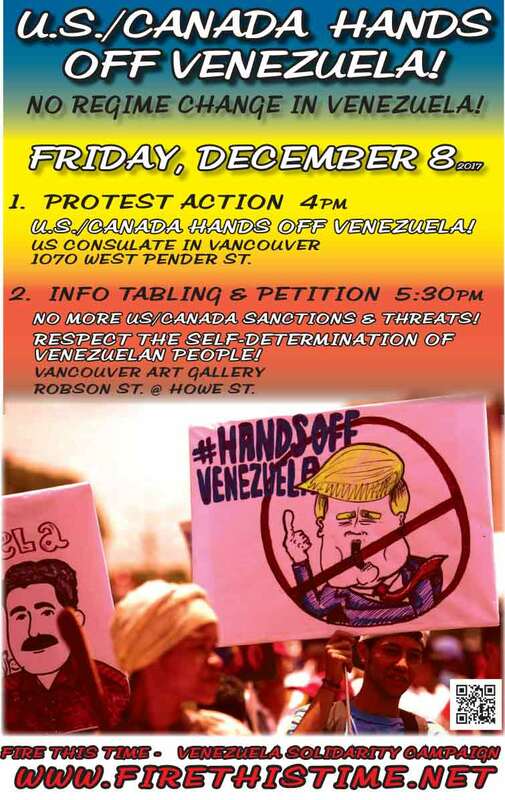 Endorse the Campaign to End US & Canada Sanctions Against Venezuela! 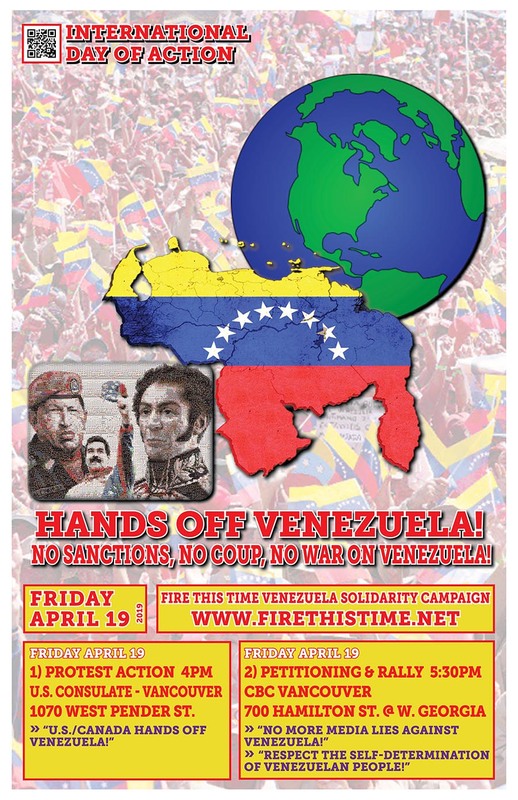 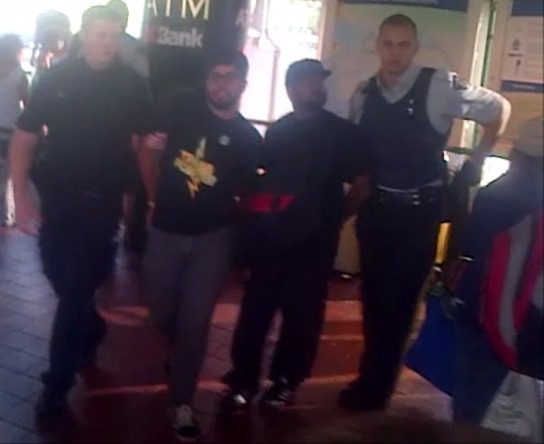 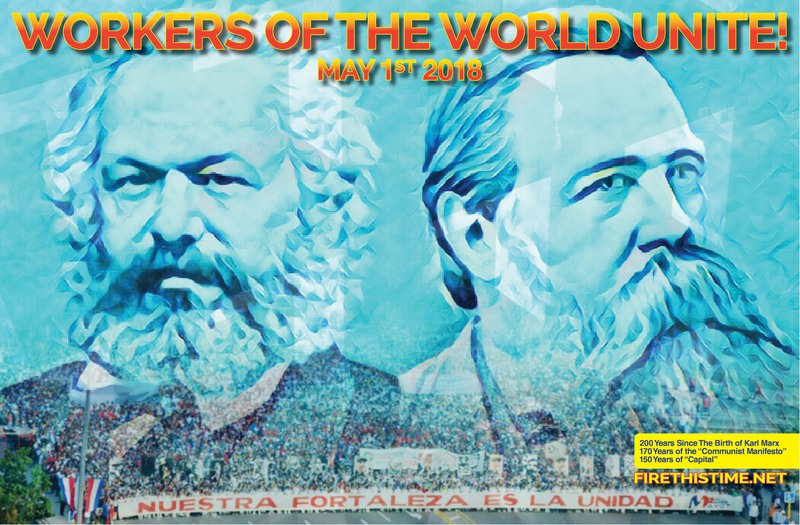 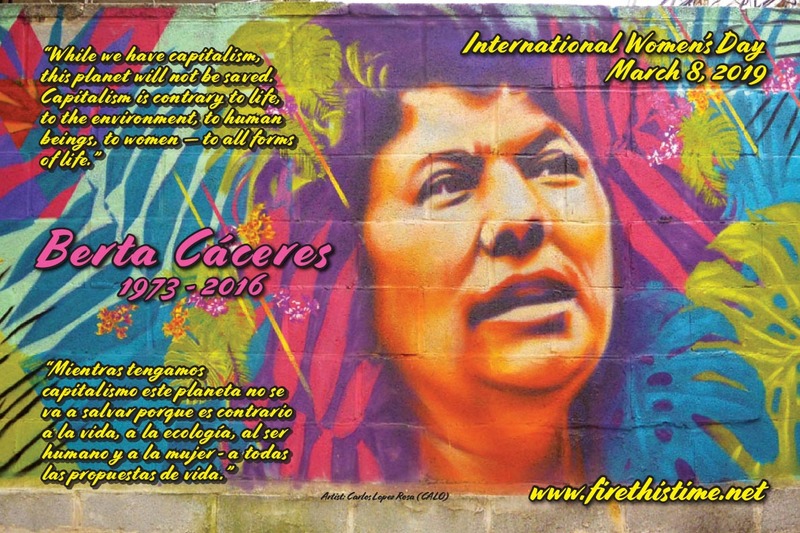 Click Here to Follow Fire This Time Organizers in Venezuela! 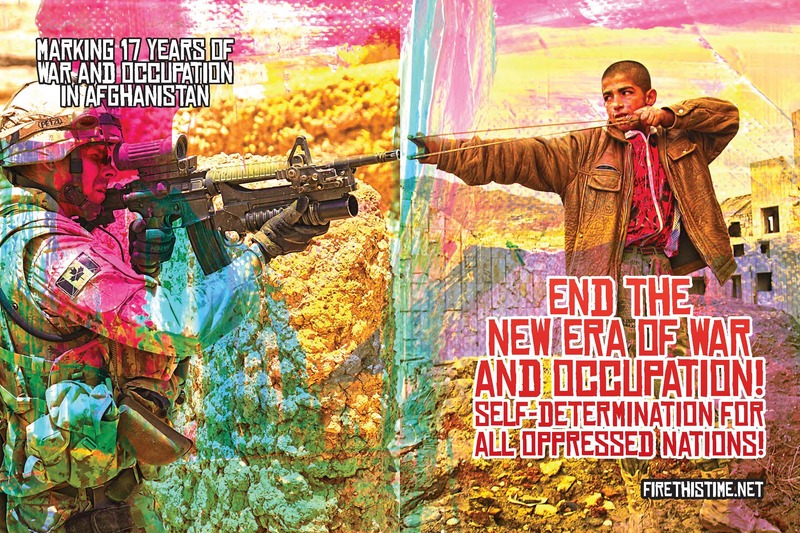 FTT Statement: Israel Hands Off Jerusalem! 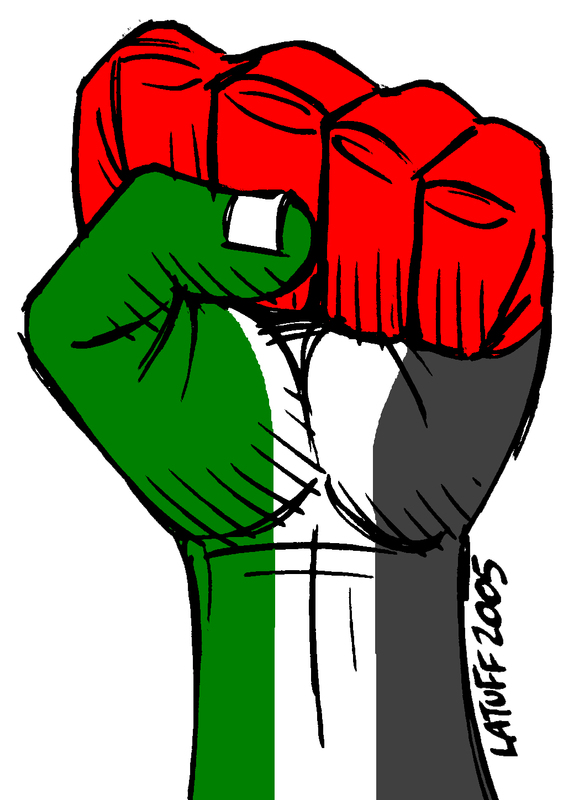 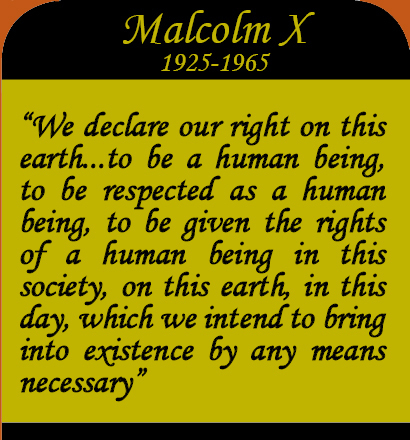 & Self Determination for Palestine! 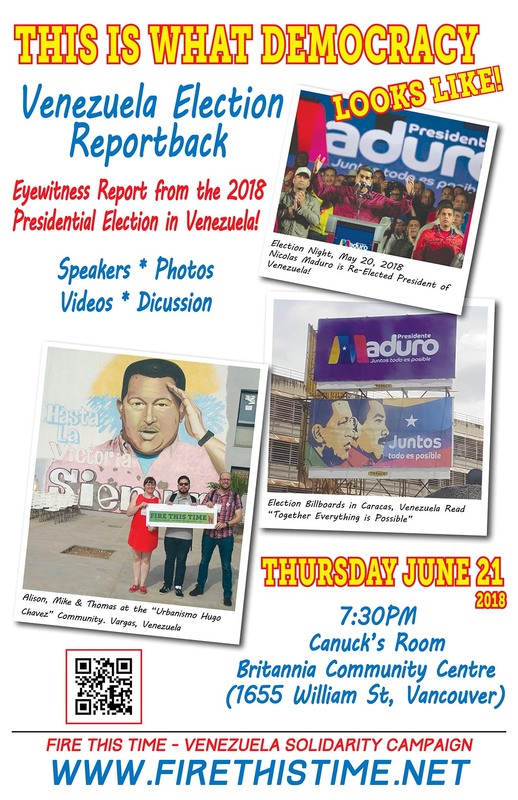 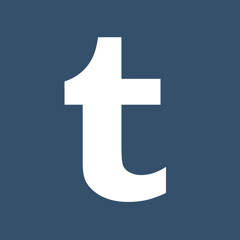 Events - Reports - Statements - More! 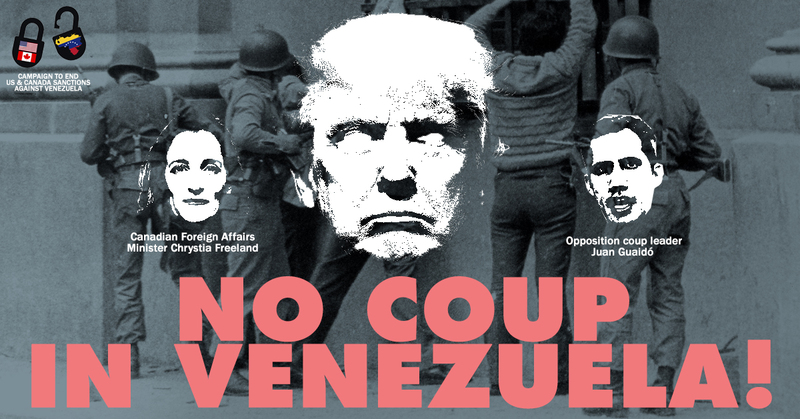 On February 13, 2018 the Lima Group met in Peru for the 5th time. 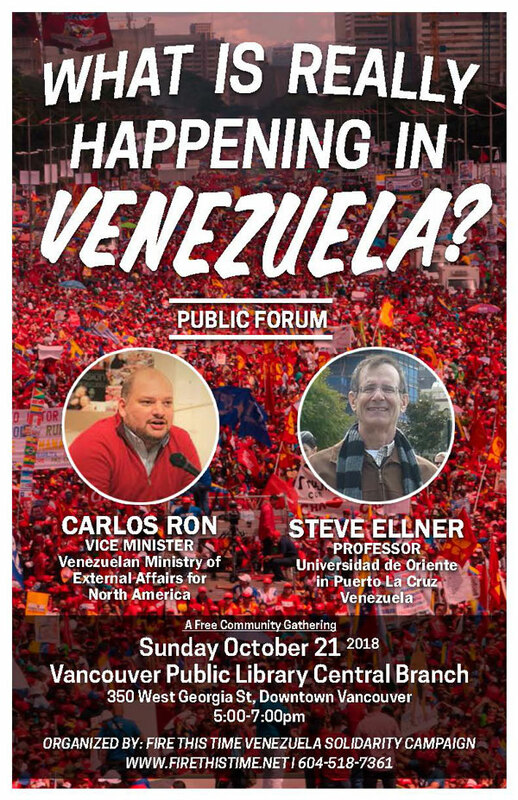 Once again, the Foreign Minister of Canada, Chrystia Freeland, played a leading role at the meeting in promoting the threats and interventionist rhetoric the meeting propagated against the government of Venezuela. 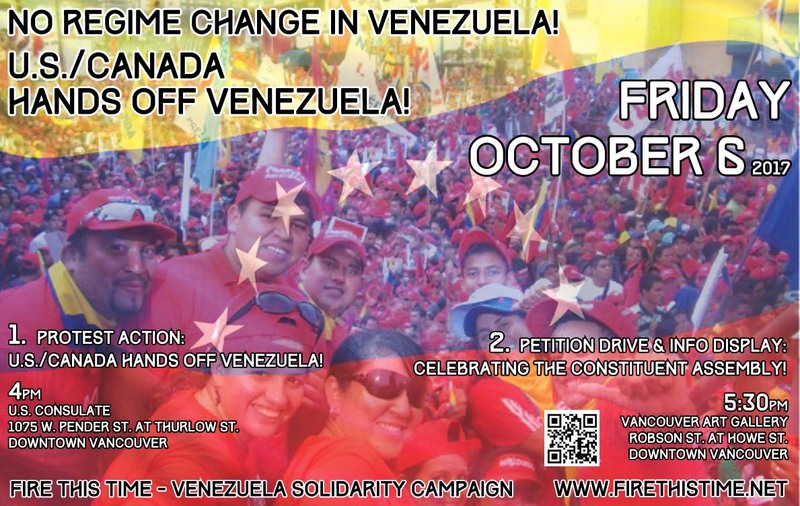 Congratulations to Venezuela on its Successful Constituent Assembly Elections! 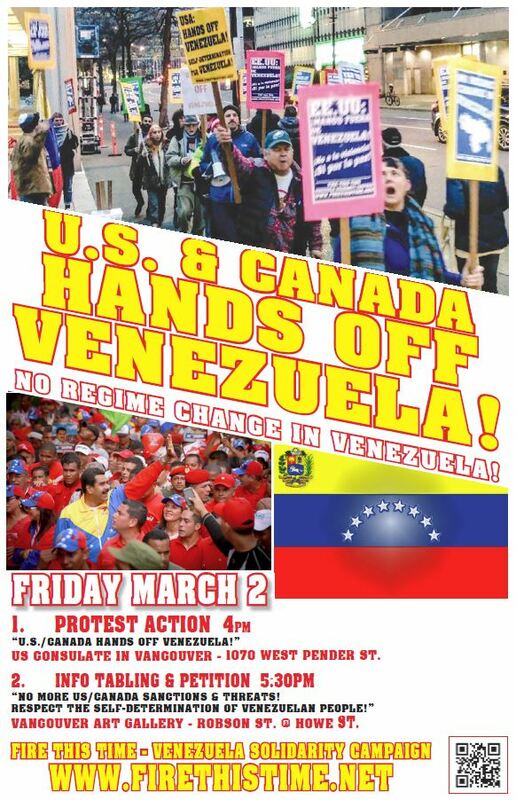 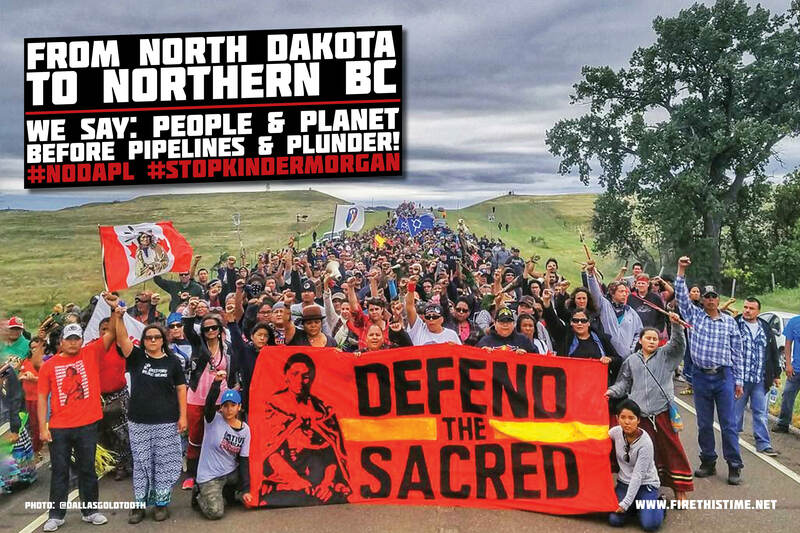 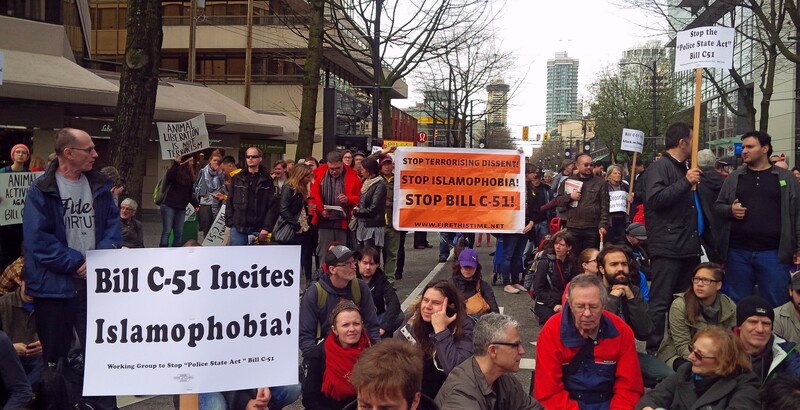 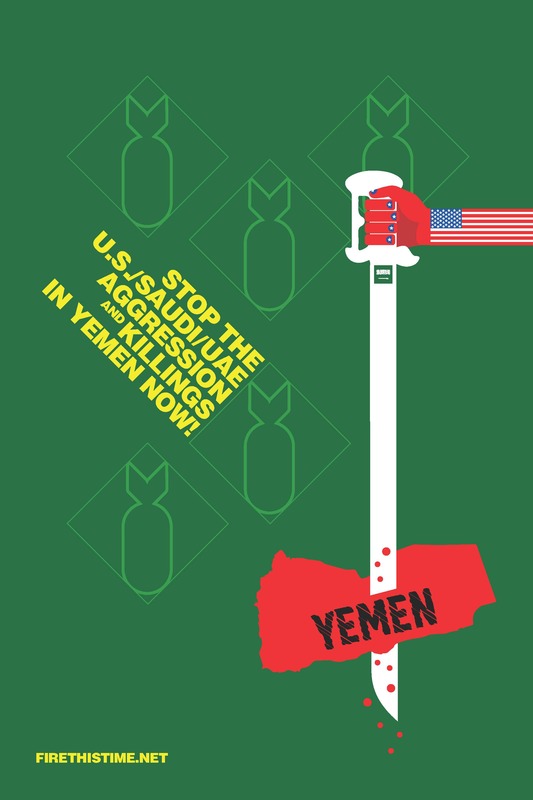 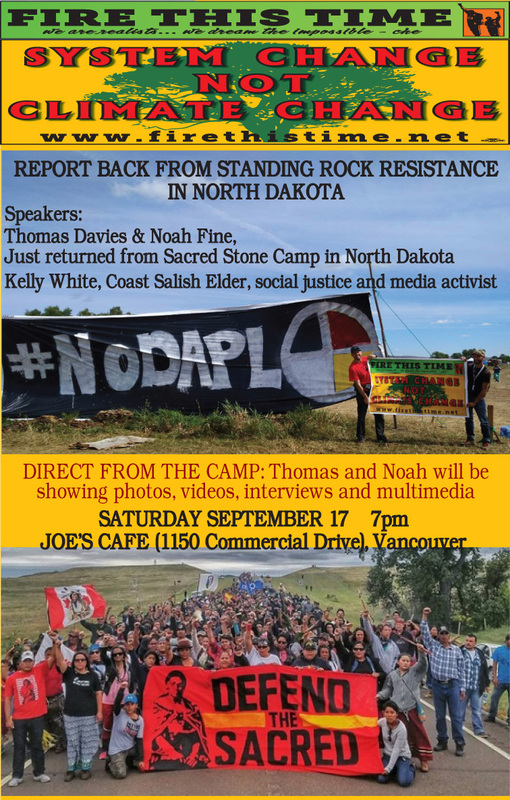 No to US/Canada Threats and Interference! 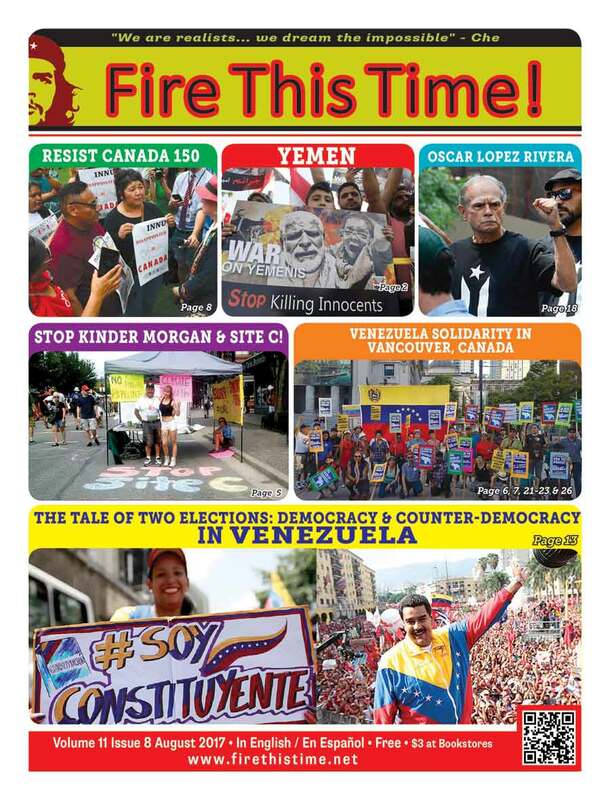 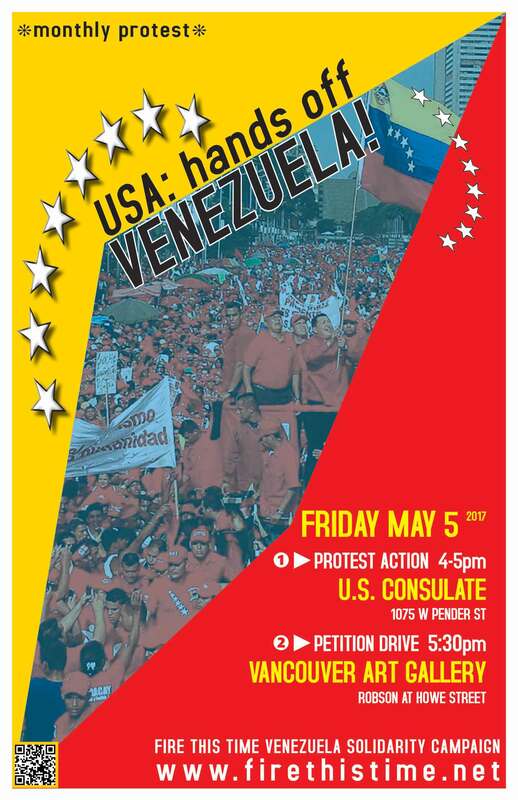 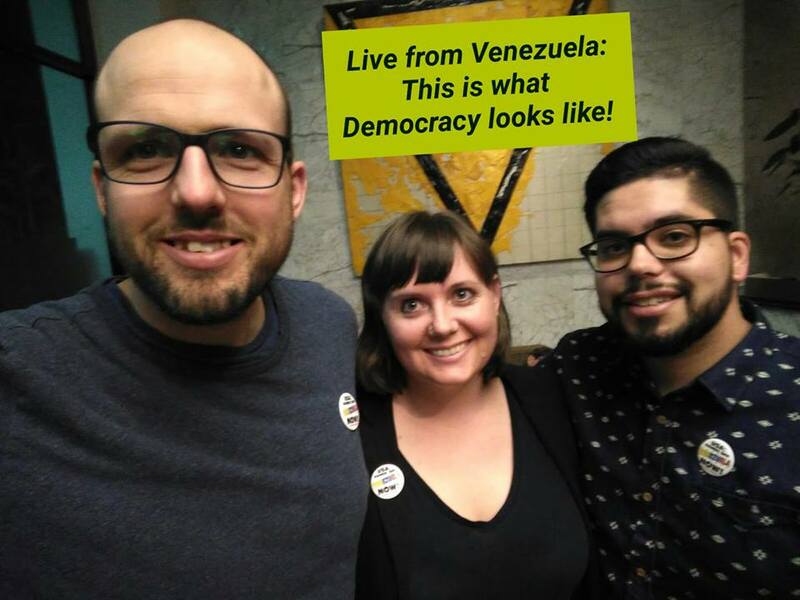 The Fire This Time Movement for Social Justice -Venezuela Solidarity Campaign congratulates the Venezuelan people for their overwhelmingly successful Constituent Assembly vote yesterday. 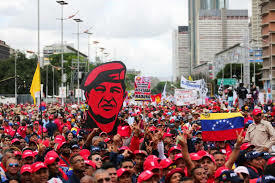 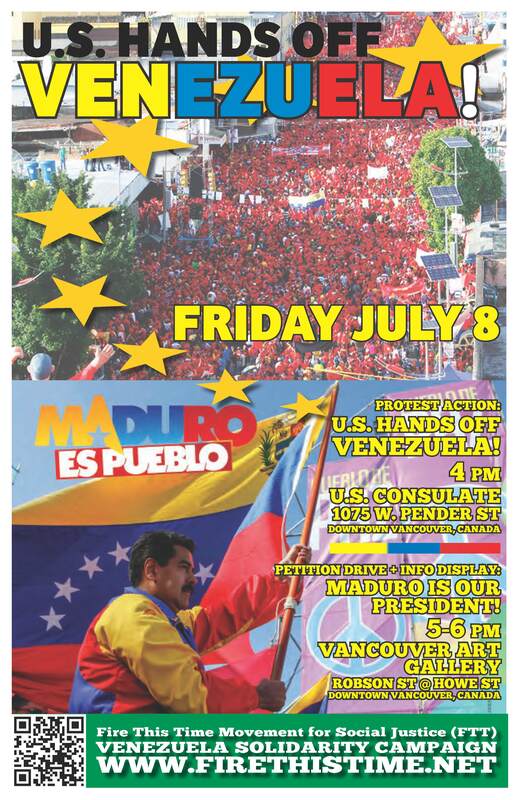 The massive turnout of over 8 million people was a clear demonstration that they were not intimidated by a US-backed campaign of violence and threats, and that the heroic masses of Venezuela continue to mobilize together in defence of their dignity and self-determination. 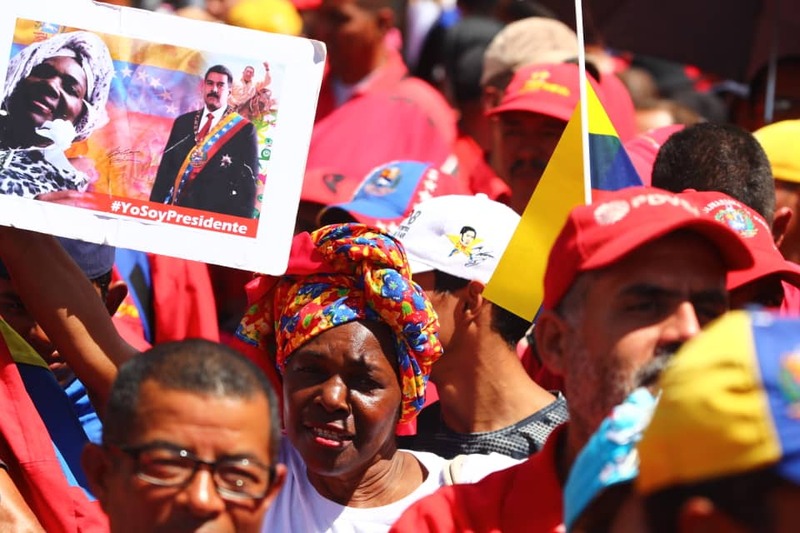 The successful Constituent Assembly vote was definitely a significant step forward for the Bolivarian Revolution led by democratically elected President Nicolas Maduro. 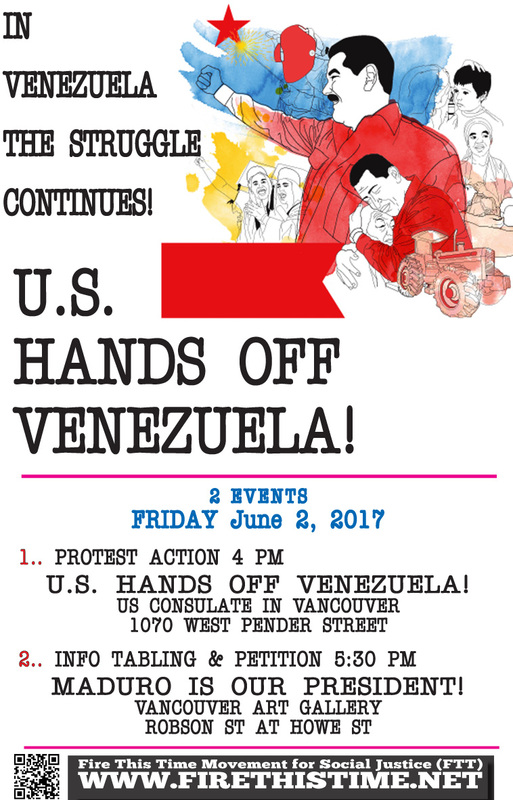 US & Canada Hands Off Venezuela! 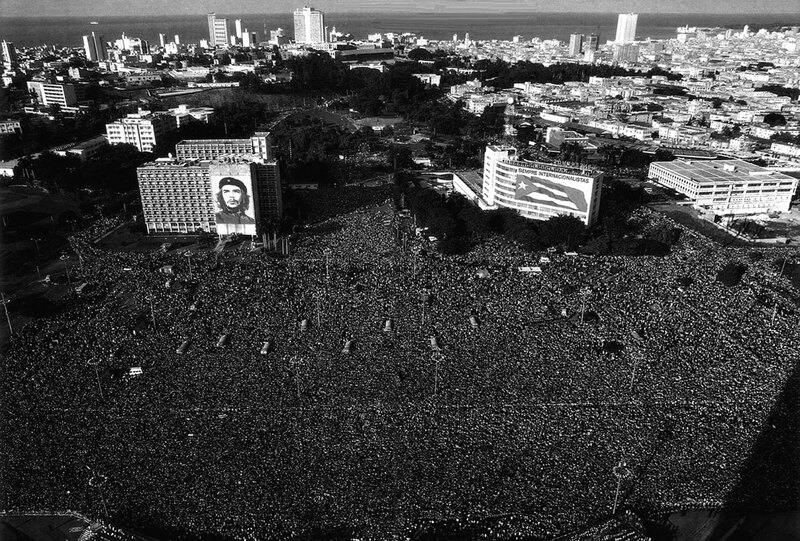 All Out for the Constituent Assembly! 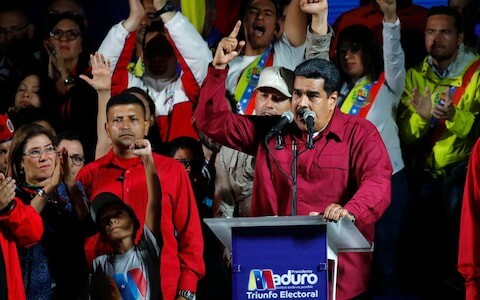 On May 1, 2017 the President of Venezuela Nicolas Maduro called for the formation of a National Constituent Assembly in order to improve and broaden Venezuela’s Constitution and strengthen the Bolivarian revolutionary process. 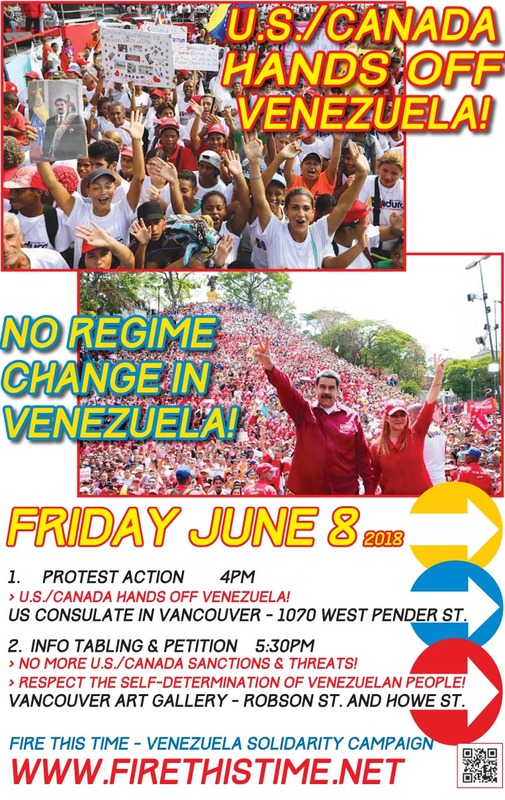 Over the last three months, in the face of increasing right-wing violence, the majority of people in Venezuela, in the millions have mobilized and organized as part of this profound democratic and constitutionally recognized process. 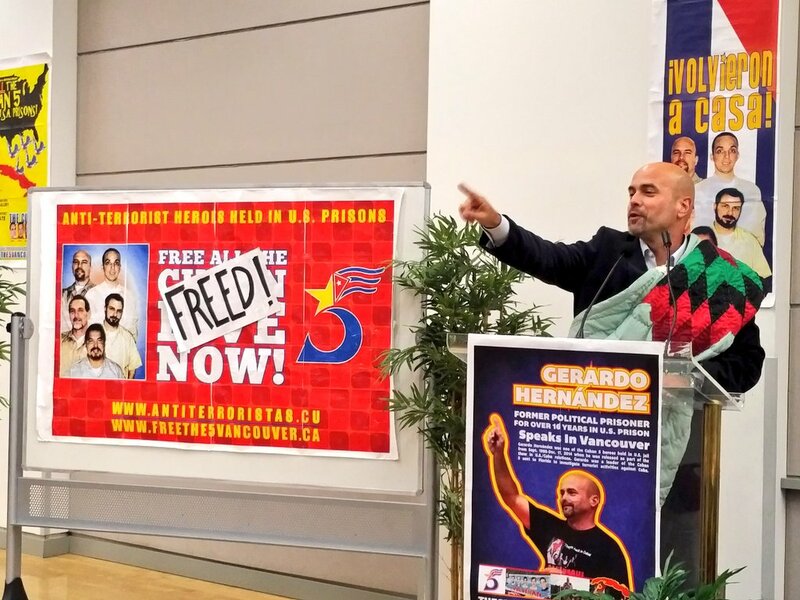 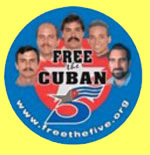 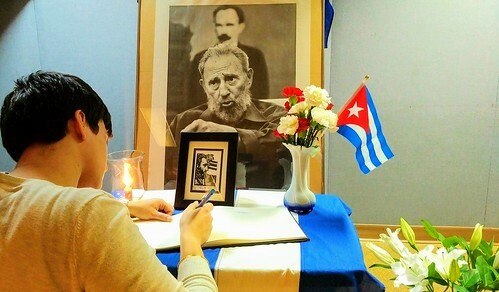 FREE THE CUBAN 5 COMMITTE VANCOUVER CELEBRATES WITH THE WORLD THE RELEASE OF THE CUBAN 5 HEROES! 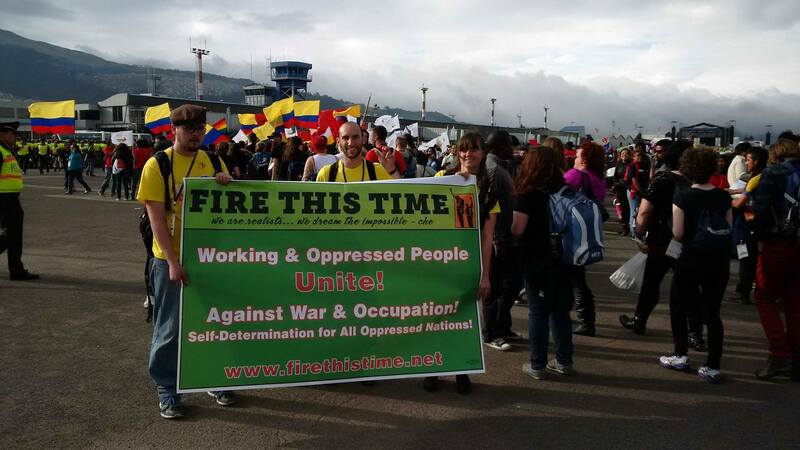 The 18th World Festival of Youth and Students opened December 7th – 13th, in the Ecuadorian capital, Quito, under the theme ' Youth unite against imperialism, for a world of peace, solidarity and social transformation', with the participation of delegations representing more than 83 countries from around the world. 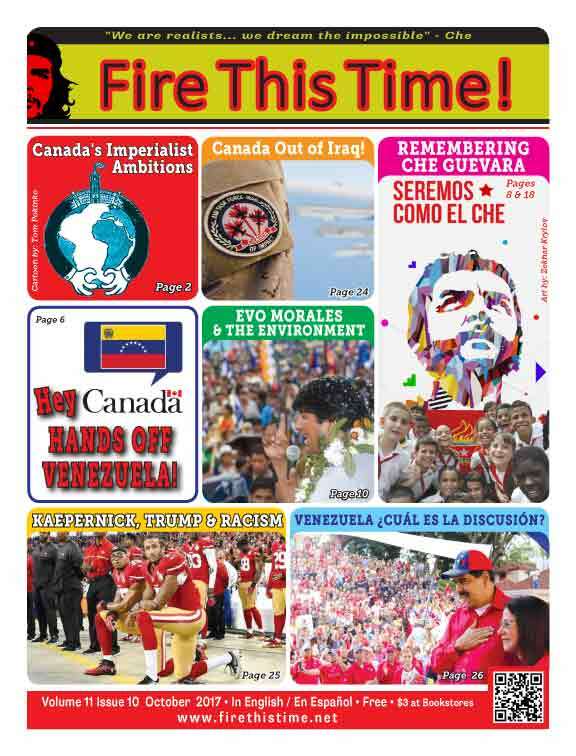 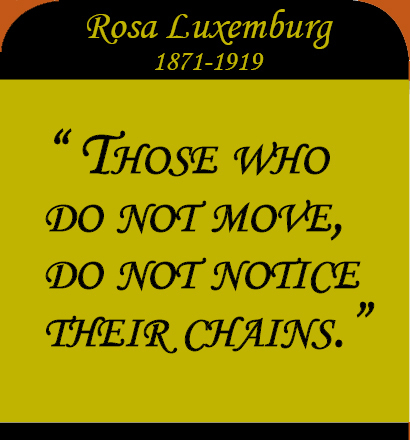 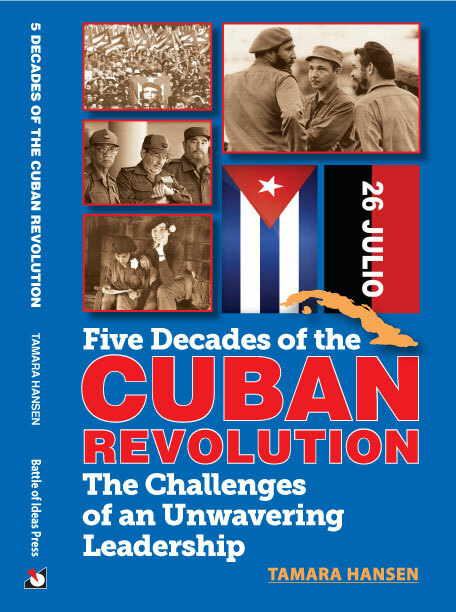 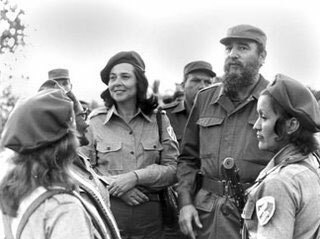 This 18th edition is dedicated to Eloy Alfaro, leader of the Liberal Revolution of Ecuador (1895-1924); Comandante Hugo Chávez; and Kwame Nkrumah, the Ghanaian independence leader. 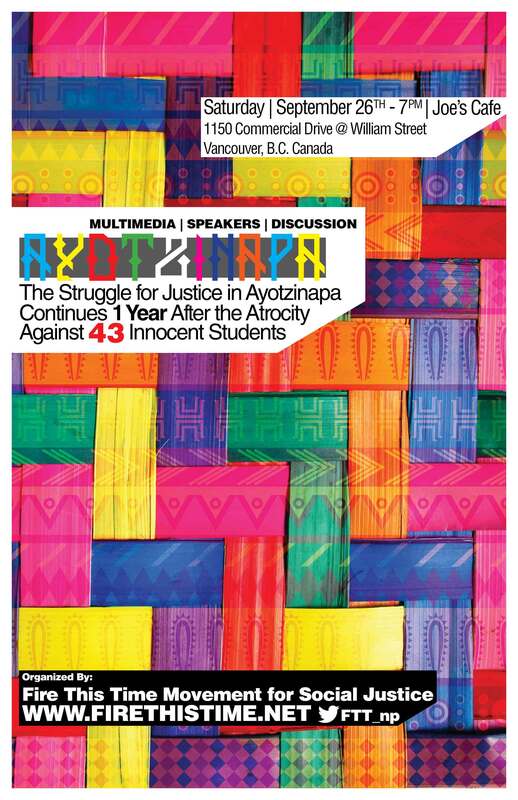 18th World Festival of Youth and Students, in Quito Ecuador, December 7-13 2013. 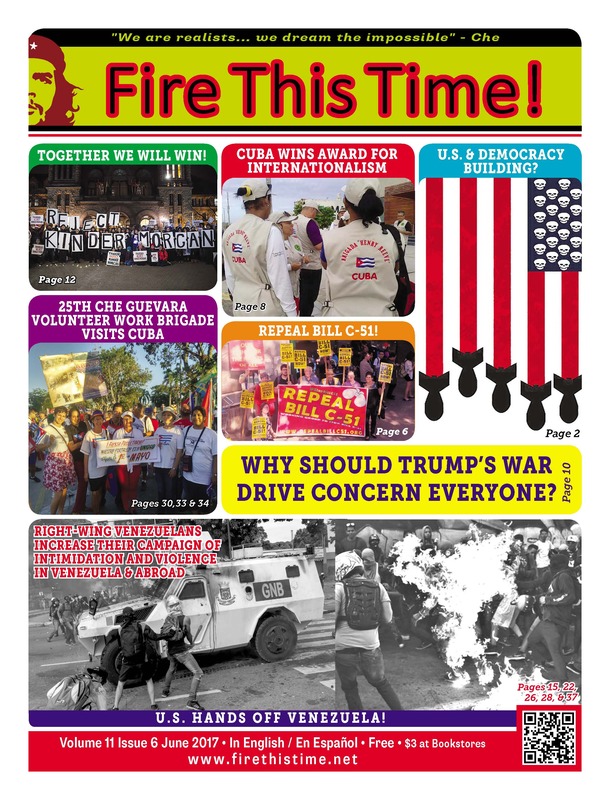 FIRE THIS TIME UNDER ATTACK! 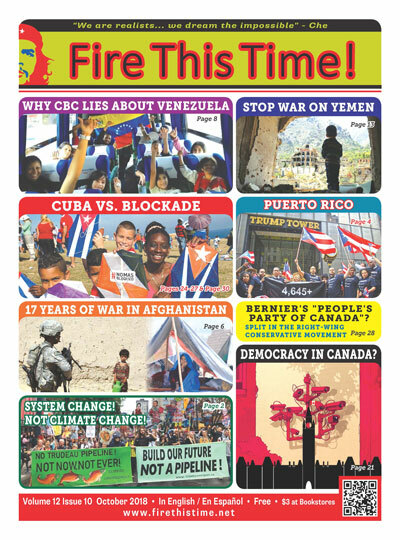 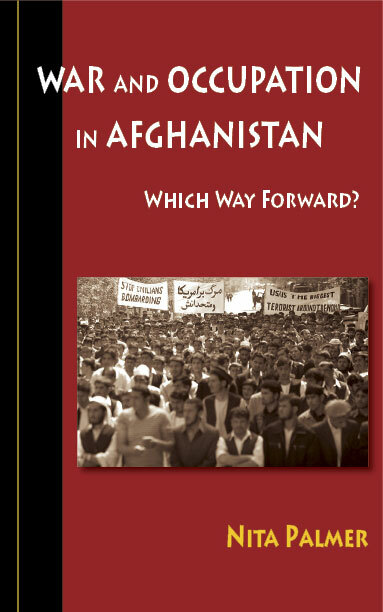 BATTLE OF IDEAS PRESS BOOKS!